How to use your intuition to invite magic into your life! This newsletter blog will give you some suggestions on how to use your intuition to invite magic into your life—in honor of the upcoming St. Patrick’s Day celebration—you know, the wee folk and all! to invite magic into your life! There’s a concept in Eastern philosophy (one of the modules in my current Ayurveda training) referred to as Dharma. This refers to “what you are compelled to do” and invites you to step into your courage and do it. The idea of having fun as we grow in life is part of your Dharma, isn’t it? If you aren’t compelled to do something, you aren’t passionate about it. So you’re probably not really enjoying yourself! Maybe you chose what you considered a “stable” path. I think many of us did, including myself—early on. That may have been ego talking—“I need stability. This is a respectable career.” Yes I know, I know. I can hear you already! As George Bailey famously says on “It’s a Wonderful Life” when his guardian angel Clarence chastises him about his desperate need for money: “It comes in pretty handy down here, bub!” I get it. But what about your passion? There’s nothing wrong with pursuing that too; and if you’re lucky enough, the two will meet and you’ll have a career that you’re passionate about. I may be over quoting here but “Do what you love and the money will follow.” Or at least what you need will follow. Do you trust that you are where you’re meant to be? Do you have faith that the Universe is on your side? I sometimes fall down the rabbit hole too. It’s usually when I haven’t been meditating regularly! Get yourself into rest and relaxation mode regularly! I wrote about simple rituals to invite Spirit back into your life in my previous blog series. As a trauma-informed yoga teacher, stress is my wheelhouse! Finding time for gentle movement with breath should be your go-to whenever you find yourself going down. And ritual is the way to make it a habit! Want to know one of the benefits of practicing mindful yoga, meditation or any other mind/body practice? As you hone in on what’s going on in your mind and body you are developing your intuition—your gut instincts. You are connected to nature! That’s step two! Consider this—if you kept giving your best friend much needed advice over and over (and over); and they never listened to you or took your advice, wouldn’t you stop giving the advice? If you consistently don’t listen to your intuition, it will quit talking to you. Maybe you’re drowning it out with worrisome thoughts or a never-ending to-do list, or lack of sleep. Back to stress management techniques! So there’s step three! Show the Universe you’re listening! Now start to actually put action behind what your intuition is telling you! Yes, sometimes those actions can be big, bold and out of your comfort zone—quitting your job, accepting a job offer, or starting a new career all together like I did! My comfort zone was definitely beyond that decision at the time! So I started it as a side-thing. You might try something you love as a hobby or part-time. Maybe that’s enough. No one said that doing what you love always meant doing it as your full time job! Start incrementally. THAT let’s your intuition know you’re listening and it will send you more! Maybe you’re not sure how to listen to your intuition, or even sure it’s talking to you. That’s step four! Ask it questions just before you go to sleep and see what answers you might get between sleep and awake. That’s Theta waves at work! Theta wave brain states occur most often in sleep but meditation and exercising “in the flow state zone” can also create theta waves. Working with this state improves our intuition as well as our creativity (remember Einstein formed the theory of relativity from a dream). For a bit more on using this technique, read my past blog on how I chose my business name, Better Day Yoga (also written for a March blog). So have you been half asleep, and have you heard voices? Insert Kermit the Frog here! You may still be wondering if this intuition thing really works. You might feel awkward about it or maybe you’re normally left-brained and analytical; and this just seems a bit woo-woo. Well I’ll end with step five! Start to notice the synchronicities and the Universe will send you more. Start to keep a diary of all the coincidences, synchronicities and kismet moments that happen in your life. When you start to write them down, this action dovetails with step number 3 above! The Universe takes note and starts to become very prolific! Reread your diary regularly to remind yourself just how much the Universe is listening to you. I promise you you’ll be amazed and humbled! I’ve been consulting with a social media guru who desperately recommends I start doing Facebook live videos. Another friend who’s savvy in that area recommends only a couple minute’s worth to keep your attention. I am dwelling on this option. What do you think? PLEASE let me know! If I move forward on this and you’re interested in being kept in the loop, please like my Better Day Yoga Facebook page! I promise to be brief, informative and hopefully entertaining! So that’s part of my dwelling process! Any suggestions? I’m holding off on a blog series for March because my schedule this month is quite erratic and overbooked! So I can’t commit to four blogs this month, but will do my best to write when I can! As is my norm, the rest of March’s blogs will be posted on my blog page here —the same page you go to for the current newsletter which IS sent via email once a month or so. They will also be found on my Better Day Yoga Facebook page here , as well as on my Instagram page here and my LinkedIn account here. Hope to see you on one of my social media sites! Please feel free to share this blog with your friends! I’d really appreciate it! Instagram Want to have a yoga class available at work? I can help with that! Written by Sandy. Posted in: Off-the-Wall Musings, Welcome to "My Better Day" Weekly Musings! A very important aspect of an Ayurvedic lifestyle includes a daily routine (dinacharya). Do you notice when your routine is disrupted, you are more easily thrown off balance and more easily prone to stress? Then convincing you of the importance of a daily routine should be easy! A daily routine is of utmost importance not just to maintain balance but also if you are looking to create change in your body, mind and soul. Kind of like meditating one day isn’t going to have a long-term effect, right? Out of all the doshas, Vata is the one who is most resistant to change due to Vata’s “mobile” quality. (See the first blog in this series to determine your predominant dosha as well as which dosha might need some extra balance). Remember similarities aggravate and opposites sooth. So routine is especially important for Vata! I should mention here that this mobile quality is involved in most, if not all, disease processes because it’s moving into various areas of the body. But that’s a huge topic on the stages of disease. It’s enough to say that if your dosha is predominantly Vata, it will be easier for you to be thrown off balance and thus invite various disorders into your system. So, again, routine is uber-important! We talked a bit about the Ayurvedic clock two weeks ago. Following the clock helps with your daily rhythm, which aids digestion, quality sleep, regular bowel movements, and stress levels. Need I go on? We covered waking up early before the sun rises as well as best times to eat to aid digestion, suggested meditation times, best times and activities to go to sleep and have good sleep, etc. using the Ayurvedic clock. This is all part of your daily routine. You probably already include at least a couple other of the most essential parts of a daily routine, like brushing your teeth, having a regular bowel movement, bathing, exercising, and wearing clean clothes. Notice that what you do habitually is easy to remember. So for the topics I cover here that aren’t part of your habitual routine, fit them in around those that are to get a rhythm while incorporating them into your life. Habits are great places to place new activities you want to include. If you’re reading this, you may also have a regular meditation/mindfulness practice and/or yoga practice. See the blog series prior to this one on simple rituals to bring Spirit into your life if you’d like some suggestions on fitting mindfulness in. And, of course, I’m here to help if you’d like suggestions for creating your own daily home practice. So what’s left, you might ask? The first one I’ll cover may take a bit of getting used to; but trust me, once you’ve started doing it, you’ll wonder why you didn’t start sooner! It’s like flossing my teeth now. I don’t feel right if I don’t. Have problems with bad breath? All gone when you start scraping your tongue! Scraping the tongue also stimulates internal organs, aids your digestion, and—very functionally—removes dead bacteria (bad breath be gone!). Do this first thing in the morning before consuming anything else. There is a whole system of tongue diagnosis in Ayurveda which is way too deep to cover here and I’m definitely still in the learning stages there! I’ll just mention that the tongue is a like a hologram for the bodily organs, similar to your ears, hands, and feet. You’re probably familiar with reflexology maps for these. Well the tongue is a “map” for the organs, the doshas (see the first blog in the series for more on doshas) as well as your digestive fire. Without getting too complicated, there’s even areas on your tongue that experience the six tastes we talked about last week. Bottom-line? Scraping your tongue affects all of the above! So what are you waiting for? A stainless steel scraper is suitable for any dosha but love my copper scraper. I like the fact that copper “disinfects itself” because it’s bacteria-resistant. Copper also provides important enzymes needed for healthy microbes in the mouth to survive. The scrapers are U-shaped. You take the “U” and gently place it on the back of the tongue and then scrape from back to front 5-10 times. I’ve read various numbers. And if you have a real problem with bad breath, you might want to scrape after every meal. I personally do this practice in the AM only. An easy one you don’t need an introduction to would be to drink a glass (or two) of room temperature water upon rising. And if you’re all in, letting the water sit in a pure copper cup the night before helps flush the system out (GI tract, kidneys etc.). Ayurveda doesn’t recommend addictive drinks like coffee or tea, but if you must have those, it’s suggested to wait an hour or more after the water. Full disclosure, I love my coffee. Holding oil in your mouth, or swishing the oil strengthens our teeth, gums and jaw. Vasant Lad, MASc says this practice also “improves the voice and removes wrinkles from the cheeks”. Warm sesame oil is commonly used but you can also get various combinations of oils. Banyan Botanicals has a combo of sesame, coconut and herbs. Use 2-3 teaspoons of oil, gently swishing around, pulling the oil through the teeth for a few minutes (some say up to 20 minutes!). The longer you do the swish, the more benefits you experience. Remember my suggestion to do it around a habit? I’m reading that swishing as you shower might be a good time. Some texts suggest spitting the oil out in the trash vs. the sink to avoid drain clog—word to the wise. Vasant Lad, MASc also suggests doing this practice twice daily. I have yet to be consistent with this practice but I’m trying! A Nasya oil lubricates the nostrils. Doing this especially when you’re in a dry hotel room really helps! So if you have trouble doing this daily, try packing Nasya oil in your travel bag. You won’t regret it! I do a simpler version of using just a couple of drops of Nasya oil in my palm, dipping my little pinky in the oil and lubricating the inside tip of my nostrils. The full description, again if you’re all in, would involve lying on your back cushioning your shoulders so your head tilts back (perhaps hanging the head off the bed) and dropping 3-5 drops of warmed Nasya oil (Vasant Lad, MASc suggests warm ghee will also work) into each nostril. This practice is one of my absolute favorites but remember, I’m a Vata dominant dosha so I have that “dry” quality. So “oily” is an opposite and very soothing. And I practice this after I shower vs. before as often recommended. I suspect many would prefer not dressing with oil on them to keep their clothes from getting oil. Oiling your body just before bed is also supposed to help you sleep soundly. I have been leaving bhringaraj oil on my hair for several hours the day I’m going to wash my hair to help reverse hair fall out I was experiencing due to hypothyroidism as well as menopause. Mahanarayan oil is my oil of choice for after shower since it helps with muscles and joints. It balances all the doshas but especially Vata. Vasant Lad, MASc recommends warming the oil and using sesame or almond for Vata, sunflower or coconut oil for Pitta and mustard or corn oil for Kapha. If there’s a favorite oil of yours, don’t let the recommendations stop you from using your oil of choice, in my opinion. I have a jasmine infused Vitamin E oil I also use. Applying oil to your body is a practice of self-love. It will improve your circulation, moisten and condition the skin and is a great de-stressor in this day of go, go. The Sanskrit word for oil means love. Enough said. There are other practices we could go into for your daily routine but let’s start here and pick something that resonates with you. Be good to yourself. The more you take the time for self-care, the more your body will respond positively. The more you are able to relax with these practices, the more tools you are providing your body to rejuvenate and heal from within. 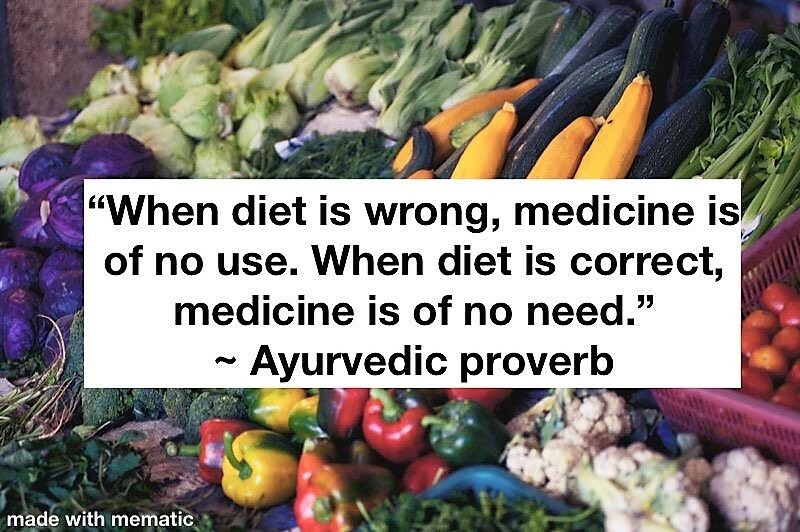 That’s the Ayurveda way—heal from within. Please let me know if I can help you in any way on your journey. We covered zeroing in on just what your energetic personality type is in the first blog and tackled the Ayurvedic clock / circadian rhythms last week. Now that you know who you are and what your preferences are, as well as the best times to wake, eat and sleep; we’ll touch a bit on just what to eat for your type. Reviewing the past two blogs will help you here. Remember opposites soothe and similar aggravates. Each dosha, or energetic personality type, has tastes that pacify and soothe their dosha. There are six tastes: Sweet, sour, salty, bitter, astringent and pungent. Ayurveda recommends that we have all six tastes in our diet and preferably in each meal. The key is to eat these in appropriate amounts for your “constitution”/doshic balance. Sweet: Pacifies both Vata and Pitta but increases Kapha. Sour: Increases (or aggravates) Pitta and Kapha and it decreases (or pacifies) Vata. Salty: Moderate use relieves Vata but increases Kapha and Pitta. Pungent: Pacifies Kapha but excites/aggravates Pitta and Vata. If you eat a little bit of pungent, the first action of pungent is to pacify Vata due to the heat qualities. Using it too much, however, will dry so it increases Vata (already dry) and Pitta (fire element is one of Pitta’s components and is already drying). On a side note, when I took an in-depth 9-month study on Ayurveda in 2014 (Living Ayurveda with Cate Stillman), I started to drill down on just what spices and foods do to our mentality, mood, and body. I used to absolutely love cayenne! I’d sprinkle cayenne on literally everything! I mean you could see red on my salad! Then I read that pungent in excess makes you …angry, irritable, aggressive, competitive, jealous, envious, and even violent. Makes sense, doesn’t it? What goes in must come out. Pungent is hot, sharp and penetrating. In small quantities that’s good. In excess, not so much! Bitter: Increases Vata but decreases Pitta and Kapha. Bitter is the most lacking taste in North America. This may be why coffee is so popular—it’s bitter. However, you know how some research shows too much coffee will cause bone loss? Over-consumption of bitter can reduce bone marrow and lead to bone loss. There are many qualities I could go into here, but won’t for now. Astringent: Reduces both Pitta and Kapha, but increases Vata. Vata prefers sweet, sour, and salty foods to soothe and balance their dosha. Pitta prefers sweet, bitter, and astringent foods to soothe and balance their dosha. Kapha prefers bitter, pungent, astringent foods to soothe and balance their dosha. Let me just add a quick note on toxins in our body (“ama” in Ayurveda). If you are consuming a lot or processed food, or not using organic vegetables (especially for the infamous “dirty dozen”), or using chemical-laden cosmetic and cleaning products; you’ll probably have some toxicity in your digestive system. Our body is so well-designed that without the toxicity, our cravings are healthy. Our body will actually crave those things that will balance our doshas! How cool is that? Cellular intelligence at its finest! However, and this is a biggie, if you have digestive issues due to toxins or other considerations, our cellular intelligence is off and our cravings become what Ayurveda likes to refer to as “perverted”. So part of the healing process of our gut is to start eating the good stuff, right? Then once we remove the toxins from our diet, our cravings will be healthy ones. So I’ve highlighted some ideas for heading toward a balanced intake above. But what about some recipe suggestions? My favorite Ayurvedic cookbook is Eat, Taste, Heal: An Ayurvedic Guidebook and Cookbook for Modern Living. Each recipe is labeled with which dosha it’s appropriate for as well as how to adjust a particular recipe to be okay for a different dosha. Genius, right?! There’s also “Dosha food lists” in the appendices for easy reference. Vata would favor all berries, dates (a super food in Ayurveda), oranges, apricots, coconut, grapefruit, grapes, lemons, limes, and avocado (healthy fats!). Pitta would favor apples, avocado, sweet berries, sweet apricots, dates, coconut, sweet grapes, mango, sweet plums, watermelon, and pomegranate. Kapha would favor apples, apricots, berries, cherries, mango, peaches, pears, and pomegranate. Vata: favor cooked vegetables—asparagus (again a super food), beets, squash (winter, butternut and acorn), carrots, cucumber green beans, leeks, onions (remember cooked), sweet potatoes. Pitta: Brussel sprouts, butternut and spaghetti squash, leafy greens, lettuce, cabbage, cauliflower, celery, fresh corn, cucumber, green beans, kale, collards, mushrooms, peas, parsley and sprouts. Kapha: Broccoli, Brussel sprouts, cabbage, carrots, cauliflower, celery, collard greens, fresh corn, eggplant, horseradish, kale, leafy greens, leeks, lettuce, mushrooms, onions, peas, parsley, white potatoes, radish, and summer squash. There are also categories for grains, legumes, dairy proteins, nuts, seeds, oils, sweeteners, herbs and spices, condiments, beverages, supplements. Too much to cover here! “Every food has its own taste, a heating or cooling energy, and a post-digestive effect. Some also possess an unexplained effect. When two or more foods having different taste, energy, or post-digestive effects are combined, your digestive fire, (Agni in Ayurveda), can become overloaded, inhibiting the enzyme system and resulting in the production of toxins. Yet these same foods, if eaten separately, might well stimulate your digestive fire, be quickly digested, and even help to burn toxins.” ~ Textbook of Ayurveda Volume 1, by Vasant Lad, MASc. This is a very important topic that we don’t always consider. You’ve probably heard to eat fruit alone? This is one of the Ayurvedic recommendations. Improper food combining causes indigestion, gas, fermentation; and yes—disease, among other things. Here’s a quick chart to start your journey. Remember to start slow. It’s a process! Kitchari is a simply prepared meal. It’s also a great balancing, easily digested complete meal in a single dish. There are many recipes out there. In my current Ayurveda training with Yoga Veda Institute, they commented that while Kitchari comes from Ayurveda, each culture has their version—kind of like our chicken soup recipes. So explore your favorite Kitchari recipes online. I hope you’ve enjoyed dipping your toe into eating with your doshas in mind. I’ve only touched upon some very basic concepts. The rest is up to you. I’m here to help if you have questions! See you next week for my fourth installment on Ayurveda! Last week was the first of the current series of blogs I’m dedicating to Ayurveda and some simple steps to make this 5000 + year-old sister science of yoga part of your lifestyle. Last week I introduced doshas—your energetic personality type, here. One of the easiest ways to start to foster a balanced lifestyle is to live according to the natural laws of nature. Just as we each have our own energetic biorhythms that define what our essential nature is (doshas), Mother Nature has circadian rhythms that affect us as humans living on this Earth. Ayurveda teaches us how to live, eat, and breathe in harmony with nature. From 2 – 6 AM and PM it is Vata time. As you recall from last week, this dosha is all about movement with qualities of light, subtle, clear, flowing and mobile—among others. From 2 – 6 AM is when our minds are more awake and clear. Ayurveda would say to rise with the sun, no later than 6 AM. Exposure to sunlight also causes a chemical reaction to that makes your body more alert. This is why insomnia experts recommend dimming your lights as the day comes to a close so you don’t have this alertness affect your sleep. Getting up before 6 AM is actually easier than you think. I’m sure you’ve woken up before 6 AM and felt totally awake, right? That’s Vata time! Ayurveda recommends getting up no later than 6 AM to meditate and do breath practices (pranayama) when your mind is the most clear (Vata). Once 6 AM hits, it’s Kapha time from 6 – 10 AM and PM. This is the dosha with the force of nourishment, lubrication and structure and has qualities like heavy, gross, dense, static, smooth and cloudy—among others. Kapha time is the hardest time to get motivated. We tend to be groggy (cloudy) this time of day. So sleeping past six will allow the heavier, denser qualities of Kapha to influence your day’s experience. This is why exercising in the morning to help rev up the engine and energize the rest of the day is helpful. Kapha is also the time in the PM when we start to become sleepy. So Ayurveda recommends going to bed no later than 10 PM. Use the Kapha timeframe to wind down, dim the lights, quit using electronics and chill. Staying up later and fighting the drowsiness Kapha brings could give us a second wind when Pitta is in full force, making all chances of a good night’s rest impossible. Journaling, restorative yoga, some peaceful breath practices, and/or perhaps some relaxing aromatherapy would all be helpful ways to prepare for sleep. From 10 – 2 AM and PM it’s Pitta’s time to shine. Pitta is the fire dosha with the power of transformation, digestion, and metabolism. This is the time when our digestive fire is the strongest which is why Ayurveda suggests eating your biggest meal at lunch. Eating our biggest meal at the end of the day, as many of us do, falls into Kapha time when our digestive fire is the slowest. Having less food energy to digest as you sleep allows the second round of Pitta time (10 PM – 2 AM) for digesting and processing all the other intake from the day—our mental energy needs digesting as well. This is the one area we don’t always take into consideration. All the mental energy we took in during the day with emails, phone calls, social media, television, traffic, work-related issues and meetings, needs to be processed by our brain. Our body also turns on its repair functions at this time. I’m sure you’ve heard how important sleep is for the health, right? Well a big part of that is allowing time for the repair functions that occur while we sleep. Your brain literally clears things out during sleep. Eating lighter at the end of the day lightens the digestive load, making it easier to rest and detox. Many ancient medical systems, including Traditional Chinese Medicine, recognize the seasonal cycles of nature and the benefits of living in balance with nature. Even modern science is catching up with the 2017 Nobel Prize in physiology or medicine being awarded to three joint winners for their discovery of how internal clocks and biological rhythms govern human life. My next series will be on simple ways to incorporate Ayurveda into your life and just like my last series of blogs, you won’t get the subsequent ones in a weekly email like this newsletter. I don’t think most want a weekly email from anyone! You can check out my blog page weekly here —the same page you go to for the current newsletter which IS sent via email once a month or so. I’ll also be posting the subsequent blogs of this next series on my Better Day Yoga Facebook page here as well as on my Instagram page here and I forgot to mention my LinkedIn account last time here. What is Ayurveda? Ayurveda is a sister science to Yoga. It literally translates to the “Science of Life” and incorporates all aspects of health—physically, emotionally, mentally, and spiritually. Ayurveda is a Vedic Science that’s a 5000 year old traditional science designed to bring the body back to balance in order to heal from within. It incorporates nutrition, lifestyle, breath practices and more to bring you to balance—mind, body, and spirit. Rather than looking at and “fixing” symptoms, Ayurveda looks at the whole person and seeks to balance areas that are out of kilter. Removing the imbalances goes to the root cause vs. just applying a bandage to the symptoms. If you give the body what it needs to balance, it will heal itself naturally. Our bodies want to heal. It is our body’s nature to heal. We just have to give it the tools it needs for balance. In Ayurveda, the whole universe is an interplay of the energies of the five elements—earth, water, fire, air, and ether or space. These are the building blocks. Kapha—comprised of Earth and Water. We start by assessing your “essential nature” known in Ayurveda as “Prakruti”. What characteristics and preferences have you had for most of the decades of your life? I remember when I first started looking into Ayurveda well over ten years ago, I had so many a-ha’s! THAT’s why I like salty foods and warm, mushy foods! Oh! No wonder I prefer warm, humid weather! Ahh! Yes, I can be like a white tornado at times and I do burn out quickly. These are basically descriptors (known in Ayurveda as “gunas”) you can see in your nature. Like increases like. Opposites soothe. I’m already “cold” which is why I don’t prefer being in cold weather. My infamous “rain barrel” is already full of cold. Likewise for dry—dry skin, dry hair, cracking joints that need a little extra lubrication. I prefer humidity. You get what I mean. The seasons outside also have characteristics putting them in the doshic categories as well. Early winter starts out Vata and late winter leans toward Kapha as we go into spring. Spring starts out Kapha and eases into Pitta as we head into summer. Summer starts out Pitta and eases into Vata as we approach autumn. The seasons of our life can also be seen through the doshic lens. Our younger years are Kapha years. It’s all about nourishment and growth—muscles grow (dense, soft), bones grow (dense, gross, hard). Our middle years are Pitta dominant. Pitta is known for transformation—goals have focus (sharp) and desire (fire). What are you becoming (spreading)? Vata predominates our latter years. There’s more dry, rough characteristics, right? Our nervous system starts to become affected more easily as we age (see the subtle, mobile characteristic there in our nervous system?) This is simplifying it quite a bit but it gives you a general idea. In addition to being a Vata dosha, I’m also approaching my “Vata” years. So my Vata rain barrel is really full and tends to get off balance more easily as I’ve aged. I’ve learned to incorporate the opposites with gusto as I’ve studied Ayurveda, increasing healthy oils both inside and out—more so during the cold, dry seasons. Once you’ve established your “essential nature” that’s been with you most of your life, you take the quiz again to see where you are currently, during the last few months or so. This is known in Ayurveda as “Vikruti” and refers to your nature of imbalance. If you’ve been having a lot of stress, this will show up in various ways in your answers. We then compare the first take of the quiz, to your second take of the quiz to see what might be off balance and needing some assistance. As explained on the quiz, if your Vikruti (second take for how you are currently) is stronger in a particular dosha than your Prakruti (first take for how you’ve been most of your life) was, you’ll want to follow a routine soothing to that dosha to bring it back into balance. If your Prakruti and Vikruti are about the same, you’d follow a routine for your strongest dosha. So are you ready to see where your essential nature lands? What have you got to lose but maybe that annoying rash, headache, extra weight, insomnia, stress? You fill in the blank (literally)! Just have fun with it! By the way, I’ve taken my share of dosha quizzes! I probably took my first quiz when I was still living in Madison, Wisconsin in the 90’s. My first Ayurveda training was back in 2010 with YogaFit’s Level 1 program and I completed Level 2 in 2015. The latter part of 2015 I completed a YogaLean week-long immersion training in Austin, TX which incorporated Ayurveda, and in between I completed a 9-month “Living Ayurveda” program with Cate Stillman. Dosha quizzes were used in each program. My current Ayurveda program is with Yoga Veda Institute and it is a 600-hour advanced track program for their Ayurvedic Health Counselor program meeting the standards set forth by the National Ayurvedic Medical Association. They have their own dosha quiz too. Yoga Veda’s nutrition module suggested we create our own dosha quiz, using descriptors we feel our audience might prefer or that we’re more comfortable with. So I created one of my own, referencing some of the ones I’m familiar with as well as Dr. Vasant Lad’s (M.A.Sc.) Textbook of Ayurveda. A complete guide to clinical assessment. Volume 2. Would you please give me the honor of being one of the first to check out my personal “Better Day Yoga Dosha Quiz”? There are two pages below–you need to hover your mouse over the bottom to see the prompt to get to the second page. Or you can access a downloadable version here. The instructions are at the top. Total the columns each time you take the quiz to find which dosha is your predominant dosha for your prakruti (how you’ve been most of your life) and then again for your vikruti (how you’ve been the past couple of months or so). I look forward to hearing back from many of you! Thank you so much! and having a deep knowing of the Truth of the Self. I hope you’ve enjoyed this first installation of my next blog series on Ayurveda! Hope to see you next week on one of my social media sites! Adding to my Ayurvedic Knowledge! Or if you want to gather with a group of friends to learn how to live a lean lifestyle while incorporating Ayurvedic principles into your daily regimen, check out my YogaLean workshop here! Please feel free to share this blog series or the above opportunities with your friends! I’d really appreciate it! Written by Sandy. Posted in: Welcome to "My Better Day" Weekly Musings! This week it gets even more personal. Have you ever found a natural rock that just felt good to hold? It could have been picked up while on a retreat or vacation or perhaps a long walk to one of your favorite places. Maybe you put it in your pocket for luck or maybe it found its way to your bedside table or your desk at work. Every time you look at it, you remember the moment you found it, or the place you found it, or the person you found it with. That’s a touchstone and the subject of this week’s topic to bring Spirit into your daily life. Did you question your good feelings when you picked up the rock? Did you for one moment think, why does this rock make me feel good? Of course not! Because you feel what you feel. No one can question that, nor should they. I have rocks, crystals and stones throughout our house! We have quite a collection! And while I can’t always remember what I did an hour ago, I can pretty much tell you each and every place I found or purchased these treasures. We remember what makes us feel good, don’t we? Maybe you like a little more décor in your environment. So polished rocks with words on them are also available. I won’t go into how many I have that simply say “Believe” (my favorite word); but I do have one next to my bedside that says “Gratitude” as well as “Meditation”. Do you remember the book, The Secret by Rhonda Byrne? She mentions the magic of a gratitude rock creating a miracle. I’ll stop there. You should really get the book. We’ve all heard and read how feelings of gratitude can be healing. At the very least it will remind you to stop and feel gratitude at the beginning and end of your day just by gazing upon the stone. Now your treasured find could serve as a worry stone. You know what I mean, right? It’s the kind of stone that fits into your grip so well you can rub it between your thumb and index finger for a soothing sensation. I’ve found natural stones that fit the bill but they’re out there in various forms. There’s a cute little retail shop on the way home from the north shore that sells small ceramic ones formed just right. They have words like “Namaste” as well as “Gratitude”, among others. One year this was my Christmas gift to each of my students. You can also find various medicine bag necklaces to put your teeny tiny treasures in and wear them close to your heart. I have beaded ones and a couple leather ones with drawstrings. You can insert tiny stones, crystals, medals, herbs that smell nice or offer medicinal qualities—you get the idea. The medicine bag comes from Native American history and is often worn for maintaining personal harmony. Some include sage, sweet grass, or cedar—all healing, cleansing smudgeable herbs. Some include food items like corn or seeds or even flowers for the “medicine” they contain. Some might include a feather inside or out as part of the decoration. Buy one and fill it with YOUR personal mementos—only YOU know what resonates with YOU. And if necklaces aren’t your thing, but Native American art is, you can hang a typical medicine bag near where you’ll appreciate it most. Over the years, we’ve gifted several small holding containers to each other. I think the one thing I am most grateful for is her dear friendship over these 40+ years. Pyramids are also a symbol of gathering energy and sending it upward. You can find small pyramids that are made of various crystals or that can open up for you to insert your list or other treasure inside. I have a collection of prayer beads. I grew up with my favorite rosaries and still have these treasured gems—like the one I made my first communion with and the one my husband gifted to me that I held down the aisle at our wedding ceremony. I had planned to put my mom’s rosary inside a picture box with some fancy dress gloves and a veiled hat. Sadly, that project never happened. 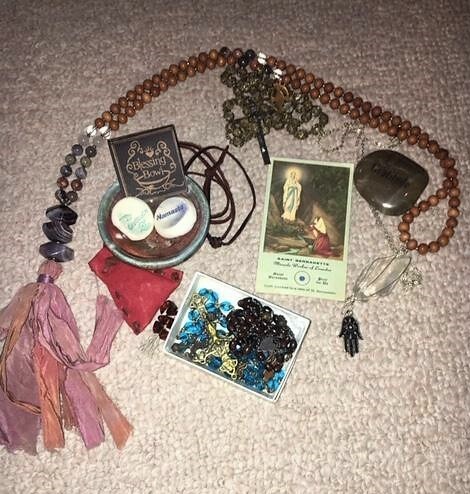 I recently discovered this collection of pieces in storage and immediately rescued the rosary from the box. It now sits next to me as I type. I believe it contains her energy. She touched this chain of beads more than any other person on this earth. So it’s like she’s right next to me. I know I can feel it. My mom (in-law) wore her rosary out. She prayed on it daily, if not twice a day, as did her husband on his. We have those two rosaries together, as they should be, in a box. If you don’t think rosaries contain energy, well, think again. They’ve been a source of inspiration for both my husband and I for many, many years. Now for the malas! I used to collect Neil Diamond albums whenever I accomplished anything exciting in my younger life. Once yoga entered my life, the spirituality of the practice did as well. I bought one of my first malas to commemorate achieving 500 hours of yoga training, and then again when I achieved 1000 hours of teaching yoga, and again when I was certified as a yoga therapist, and most recently when I graduated from 100 hours of Yoga Nidra training with Indu Arora last year. It’s become a “yoga thing” for me. Some would say a fetish, but let’s not go there. You see it combines my love of crystals with my love of yoga so this ritual is a bit unstoppable. I still say Hail Mary’s on most of my malas. Old habits are also rituals, aren’t they? When was the last time you commemorated an accomplishment with a treasured something, something? It doesn’t have to be prayer beads. I am absolutely enamored with the story of St. Catherine Laboure and the miraculous medal. I have owned three medals, two from my childhood that traveled with me through life until I gifted one to a dear friend who needed a miracle at the time. One is embedded inside a prayer card I purchased at Holy Hill in Hubertus, Wisconsin. I still wear the one medal on special occasions. When my mom (in-law) passed away, I realized that St. Catherine’s birthday was May 2 near the date of the funeral. So I wore it that day knowing mom would’ve been pleased. St. Catherine’s story reminds me of so much—of faith, of my childhood, and most of all—believing in miracles. What makes you remember to believe? Surround yourself with that. One time during a yoga therapy training, we were working with chakra energy (energy vortexes that correspond to our endocrine system—they’re in my logo) and using a pendulum to measure the energy of each chakra down our spine. I had purchased a hamsa necklace seconds before at the boutique open during the training. They hadn’t suggested removing jewelry so I was still wearing it. When the pendulum check got to my throat, the circular motion stopped and went very haywire, bouncing this way and that. I thought for a moment and figured let’s try removing the necklace. The pendulum circled beautifully around my throat chakra after I removed the hamsa. I kid you not! There’s something to it! Open hands are very symbolic. My most recent purchase of a hamsa was, again, at a yoga conference (I need a jewelry anonymous meeting, don’t’ I?). It has a beautiful clear crystal wrapped just above it. It makes me feel downright protected when I travel long distances. Do you have a piece that you wear when you travel? Maybe you have something in your car for safe travel—perhaps a St. Christopher’s medal? I purchased one for my husband for our five year anniversary. I’ve mentioned a few of my favorite Saints here. For those of us that want a different kind of touchstone, remember the prayer card I mentioned above? You can find them dedicated to various Saints, some containing medals like my St. Catherine prayer card, some commemorating the passing of a loved one. Maybe you can find a special prayer card and post it in a special place to remind you of that special someone, or your belief in prayer, saints and angels. Perhaps place it on your bathroom mirror, or on your refrigerator. Where will you see it most? I used to read a children’s book about the story of Saint Bernadette and Our Lady of Lourdes over and over each year. It’s the story of ‘Bernadeta’ seeing Marian apparitions at the grotto in Lourdes, France. Miracles, again, make an impression on me. How about you? I wish I’d kept that book when I moved out on my own. Sadly, I did not. But I still have a prayer card containing a cloth touched to a relic of St. Bernadette. It still means something to me. Do you have a favorite Saint? I still own a statue of the Blessed Virgin from my childhood. It sits upon my dresser and is one of the first things I see in the morning. What do you see first thing in the morning? Does it bring you peace? What makes YOU feel good? What memento brings you good memories? What reminds you to send a prayer to the heavens? Surround yourself with THAT. Then it will only take a moment to bring Spirit into your life when your eyes land upon your specially chosen spot. Now, on to this week’s topic! If you aren’t regularly making time to connect to Spirit, Spirit won’t have a venue to talk to you because you obviously aren’t listening. It’d be like leaving messages and sending gifts to a relative or friend but never hearing back or getting an acknowledgement they’ve heard from you. Eventually you’d quit, right? The same goes for Spirit. Once Spirit knows you’re listening, the floodgates open! I am speaking from first-hand experience! I like to take a moment in the morning to contemplate a question for Spirit—maybe it’s some advice I need. It could be before I get out of bed, perhaps just after I’ve meditated, or maybe after I’ve exercised and done yoga. I could chose my moment just after I light a candle, as I wrote in my first blog on this series. If mornings don’t work, you can do this practice in the evening too. As you can imagine, these random connections can happen any time you’re feeling like you need a fix! The Science of Mind Magazine has great daily readings. I’ve been subscribed for years and use many of them for my final relaxation readings at the end of a yoga class. “Sandy, have you been leaning on me lately? Day and night, rain or shine, Gummi Bears or Gucci? Sometimes a particular reading from these above-mentioned books resonates with me so much at the time because they’re spot on to what I asked about. So I’ll reread that particular passage daily for a while to let it really sink in. Why not? THAT’S the reason Spirit sent you the message, right? If it resonates in a big way, keep dwelling on that message! Keep in mind that if the topics that interest me don’t interest you, any random reading from pretty much any book can carry a message. Try it. You’ll see. A random card pull from a motivational deck of cards. If you prefer a different kind of random pull, you can use a deck of cards. I like to shuffle the deck until one pops funny. It could drop out, it could flip over, or it could just stick out in a unique way as I’m shuffling. Somehow it let’s me know, THIS is the one! And then I always take the bottom card from the portion of the deck that’s still in my hand and do a two-card reading. If two cards happen to pop out, I’ll still grab the card from the bottom of the deck. I figure Spirit knows my M.O. and may have been trying to get that bottom card to me somehow! You don’t have to do it my way. I just thought I’d share. Many times the cards have a full message, but depending on your time, you can just read the summation or key word. Bing, bang, got it! This is just the tip of the iceberg of what I own. I finally had to admit I have a fetish for them and stop buying new ones! I even started to train to read Tarot cards (I’m a work in progress!) They are fun, quick and I promise they’ll become one of your best resources to talk to Spirit. The Secret Daily Teachings by Rhonda Byrne is in a calendar format. I still like to randomly flip in this one too. Inner Reflections by Self-Realization Fellowship founded by Paramahansa Yogananda is my favorite daily use calendar spiral book. It doesn’t have daily readings so much as beautiful photos and affirmations/quotes scattered throughout. When I’m feeling disconnected from Spirit, these suggestions are like picking up the phone and literally dialing up Spirit (I may be aging myself with that term!). It’s like talking to an old friend and asking for their advice. No matter how long it’s been, Spirit remembers you. It helps to be a bit centered prior to doing a random reading—at least for me. So remember to take a deep breath, think of a question or area of advice that you’re working on prior; and trust me, the responses you get will start to amaze you! Whatever portal you open to spirit, I promise you, the messages will come! That didn’t take any time at all, now did it? Enjoy! P.S. I’ll add here, that if you are exceptionally down and you DO have more time, you can always do multiple card readings, random book readings, etc. Sometimes I need a good talking to. Maybe you do too. So give yourself this gift of time. Last week I introduced this series of blogs on easy ways you can bring simple rituals into your daily realm to invite Spirit back into your life. These rituals take no more than a few minutes and will easily fit into your daily schedule. And as I mentioned last week, if one doesn’t resonate with you, perhaps the next topic will. Do you ever find yourself stressed while driving? Perhaps you drive to and from work during rush hour when traffic can get a little, shall we say hairy? It’s sometimes hard to stay calm as you notice how many other drivers are perhaps texting or simply wanting to drive right through you! How do you insulate your nervous system from this onslaught of stress? It’s an important question because it’s the quality of life every day that creates your overall health, right? Try turning off the radio and humming a favorite tune and if it happens to be a spiritual song, or one that reminds you of loved ones, even better. When I’m driving and want to stay calm, humming some of my favorite songs brings me back to center. My go-to song to hum all year round is “Silent Night”. This song pops into my head immediately when I’m driving. Sometimes I find myself humming it before I’ve even realized I started humming—like the infamous “Pavlov’s dog” experiment. I get in the car and start to hum as I start to drive because my subconscious knows that’s my M.O. If it’s a long drive, I have a playlist of sorts. “Silent Night” turns into “You are my sunshine”, which has a very emotional component, calling to mind my mom (in-law) as well as my great aunt (in-law), both of whom have passed. Next I hum “Que Sera Sera” which my dad used to whistle to himself. When I find myself missing him terribly (he passed away in 2003), I’ll hum the “Polish National Anthem”. My parents were both born in Poland and I went down the aisle to the Polish Anthem as a surprise gift to both sets of Polish parents. (My in-laws are also 100% Polish.) My dad could play this tune on his harmonica to his dying day (from Alzheimer’s). It was his favorite song and would always bring tears to his eyes. Humming has a calming effect in and of itself but the songs you choose to hum will also add to the healing environment you are creating with the sound of your vocal chords. It’s like inviting my best friends into the car with me—my most supportive relatives surrounding me. 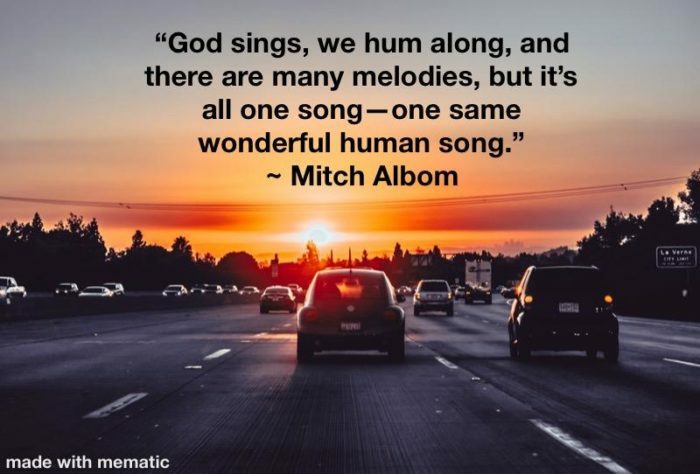 The songs that have come to mind when I drive bring soothing memories and a reminder of important connections in my life. Maybe it’s a spiritual song that brings you comfort. Maybe it’s like the ones I’ve chosen. Although it’s really more like they chose me! I believe everything’s a sign and I’ve often thought the songs that have made it to my playlist are my relative’s way of reaching out to me when I need it, especially when the song just starts humming itself unprompted. Then at other times I know that humming the tune by conscious choice will bring them to mind. And this conscious choice literally brings their spirit to me whenever I am in need of their particular message—like a calling card of sorts. Sometimes I just need a reminder of what their presence meant to me in my life to bring me back to center. How about you? Do you have certain favorite songs that bring someone special to mind? Invite them back into your life by humming “their song”. They’re only a song away. Try it! You’ll see. Humming relaxes you in mind and body, reduces fear and worry; and keeps you grounded and focused. It’s kind of like your own white noise filling your mind with soothing tones vs. the monkey mind of chitter chatter your ego likes to go on and on about. I’ve read that humming helps you concentrate (some auditory learners need that white noise) among many other benefits. You may have read that our iPhones are taking our concentrative powers away! We have an antidote—humming! Try humming a few tunes the next time you’re on the road and see if you arrive at your destination a little calmer, more centered and at peace. Written by Sandy. Posted in: Newsletter, Welcome to "My Better Day" Weekly Musings! Happy 2019! How has the year started off for you? Getting back to our usual routines can be a blessing, can’t they? The end of the year is a whirlwind of activity, throwing us off our usual routines; and perhaps leaving us tired in mind, body, and pocketbook. Some of the aftereffects can show up as less patience, feeling less grounded or even lethargic. When this happens, I know I’ve quit listening to Spirit and need to get back to my usual, very simple routine rituals that invite Spirit into my life. So I’ll be writing a series of blog posts on easy ways you can bring simple rituals into your daily realm that take no more than a few minutes. If one doesn’t resonate with you, perhaps the following week’s will. Consider it my New Year’s gift to you, my readers. Don’t worry, I won’t be emailing you weekly! Am I the only one who thinks some of the emailing has gotten out of hand? You can check out my blog page weekly here —the same page you go to for the current newsletter which IS sent via email once a month or so. I’ll also be posting the intro to the blog with the same link on my Better Day Yoga Facebook page here as well as on my Instagram page here. I hope you’ll join me. At the very least, you’ll gain some peace of mind and spirit while reading the post and perhaps you’ll acquire a new favorite ritual to carry with you into 2019. Say a small prayer or affirmation. If you’ve chosen incense, let the smoke waft over you as though you’re sending yourself a blessing from Spirit. My husband and I both love Palo Santo wood. It doesn’t burn for long after being lit, so it’s a quick blessing and smells so amazing! All wood scents are very grounding. They come from a tree, so you are being surrounded with the grounding energy from the tree’s innate ability to root down deep into Mother Earth. I memorized that prayer years ago. There’s not a time I light a candle (which I do at least once a day) that this prayer doesn’t come to me automatically, silently repeating in my mind. It sets the tone for my day immediately. See, I told you it would be simple, only take a few minutes and fit right into your daily routine. I wish a grounding peacefulness to embrace each and every one of you as you start your day. Until next time! New Year’s resolutions on your mind? Looking to make a change? Are you searching for real transformation in your life? Do you want to lose weight and gain vitality? Hoping to de-clutter both physically and mentally? Are you curious about learning to meditate for greater serenity? Join the YogaLean 12-week Transformation! This workshop is available as either a private residence group class or on-site corporate class. Details here. Adding to my Ayurvedic studies! I’m deepening my Ayurveda training through Yoga Veda Institute’s Ayurvedic Health Counselor program! Four years ago I studied with Cate Stillman in a 9-month program called “Living Ayurveda” and it’s time for more! Ayurveda literally translates to “Science of Life”. Ayurveda is a Vedic Science that’s a 5000 years old traditional science designed to bring the body back to balance in order to heal from within. Ayurveda incorporates nutrition, lifestyle, breath practices and more to bring you to balance—mind, body, and spirit. The YogaLean program I detailed above incorporates Ayurvedic science as well. If you’re curious, please check it out or go to that page on my website for links to quizzes to find out your Ayurvedic body type/individual nature/dosha. Each person is a unique combination of the five elements and we each have a different proportion of each existing within our personal make-up. Vata is predominantly Air and Ether, Pitta is predominantly Fire and Water, and Kapha is predominantly Earth and Water. Being aware of your dosha allows you to identify protocols used in Ayurveda to align with nature—both your internal nature and your external environment such as seasonal cycles and circadian rhythms. It helps you to really hone and own your best assets! Curious? Schedule a one-on-one Yoga Therapy appointment with me and we can discuss your unique health and wellness! Please feel free to share my blog series or YogaLean program page with your friends! I would be most grateful! Happy 2019! I love this time of year. Magic permeates the very air we breathe. It’s in the Christmas trees all lit up with sparkly lights and decorated with personal mementos of Christmases past. 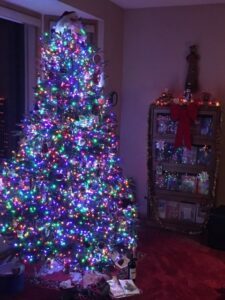 Have you noticed the Christmas energy emanating from your tree during the season? Take another look. When I was younger I used to pass the time just staring at our childhood tree—day or night. I’d come up close to an ornament to see how big my nose would look and back away slowly, enamored with all things Christmas. My parents didn’t always get along—(enough said here). Yet I still found solace in this holiday. I’d sit on the floor in my bedroom, after having lit a Christmas candle on the dresser, and gaze upon it as I rocked and sang all the Christmas songs I knew. The spirit of this season soothed me. As I progressed into young adulthood, I’d find myself parked in my apartment parking lot just staring at the house lights around the neighborhood taking it all in before I went inside. My Christmas meter never got full this time of year. It was then that I started decorating for Christmas and writing my own Christmas cards. I still have pieces from my first apartment that I use today. A blue Charlie Brown ornament comes to mind. My teacher liked it so much he invited me to say it at the Beiger Mansion in my hometown for a Christmas function. I was so honored! My husband and I just celebrated our 36th annual Christmas party. We decorate every corner of our house—even the bathrooms! There’s bells on the door that jingle when you walk in, a zillion Santa’s throughout the house and the scent of ”The Smell of Christmas” potpourri permeates the house. Yes I still believe in Santa. Why wouldn’t you? He’s the spirit of Christmas. Of course, there’s a big turkey dinner AND we go caroling, for those who are game. Sadly, we’ve been noticing less and less people coming to the door each year when we go caroling. You know how some say certain things are going to become a thing of the past? Answering your door for Christmas caroling, we feared, was going to the wayside. This year we tried another direction and we had so many come to the door and joyously direct our music, some taking photos and videos, some taking a selfie with us in the background. Yes! People will still come to the door to share in a brief Christmas moment! It renewed our belief in the Christmas spirit. We all just need a little magic. God bless those lovely souls! You won’t get off my Christmas card list unless you haven’t sent me one in a couple years (and even then I still send them to certain special friends and relatives because it makes me feel good.) Our incoming Christmas cards have dwindled over the years. This saddens both of us. We still remember all of those on our list this time of year. We still send silent Christmas prayers to those who have passed and mental Christmas hugs to those who’re just too busy to continue the tradition. We will still always love you. Merry Christmas dear friends. I hope to see you either digitally online or in person in 2019. I’d love to work with you. Just prior to my Thursday 10 AM yoga class at NOLA’s, I always take a few moments for alternate nostril breath which balances the nervous system, pranayama mudras, and a little loving kindness meditation. It helps bring me to center and be the kind of yoga teacher I aspire to be. There are always “a-ha” moments during, or as a result of, meditation—especially if I’m pondering something. Today as I finished my meditation I looked around the beautiful space where I’m honored to teach yoga in NOLA’S corporate event center. The owner, Kavita Mehta, has an eye for art. She has several paintings adorning the walls. Although my eyes have landed on these walls several times, today I noticed just how many of them contain birch trees. 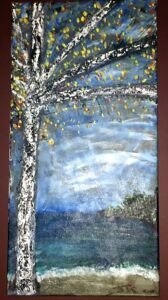 I grew up with a birch tree outside my bedroom window. My dad loved trees, as I’ve written many times before. 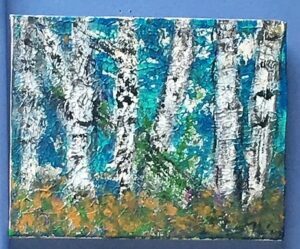 Because a birch tree was just outside my childhood window, I’ve always felt a connection to birch trees. How did I not notice the abundance of birch trees in my new yoga space? I started to snap photos of them with my iPhone to capture their beauty, knowing all the while they would be the subject of this blog. Once an idea hits me, I can’t contain myself. These are only a few of the ones containing birch trees. It was hard to decide which to include here. Birch has often been associated with renewal, awakening the energy of new beginnings and a cleansing of the past. The birch tree has been called the “White Lady of the Woods” owing to her beautiful white bark. The bark of the birch tree, hence the spirit of the birch tree, was often used to instill courage and protection. It is even suggested we meditate on birch for resilience during hard times. As a guardian, birch provides solace and safety from the madness of the world. Okay, full disclosure, the “madness” referred to in the folklore I was reading was referring to the tricks of the Faery. Don’t laugh, it won’t make the faeries happy! Faeries are part of folklore worldwide, by the way. I always say I judge by experience. If the whole world’s ancient stories include the wee folk, who am I to argue of their existence? And, for that matter, who are you to? And somehow labeling the “madness of the world” as faery/fairy trickery, makes this madness seem somehow lighter and more manageable for me. Yes, in case you’re wondering, I believe in faeries and all things magical. I’ve written about this many times, but this one is my favorite here. “If you do not believe in magic, your life will not be magical. 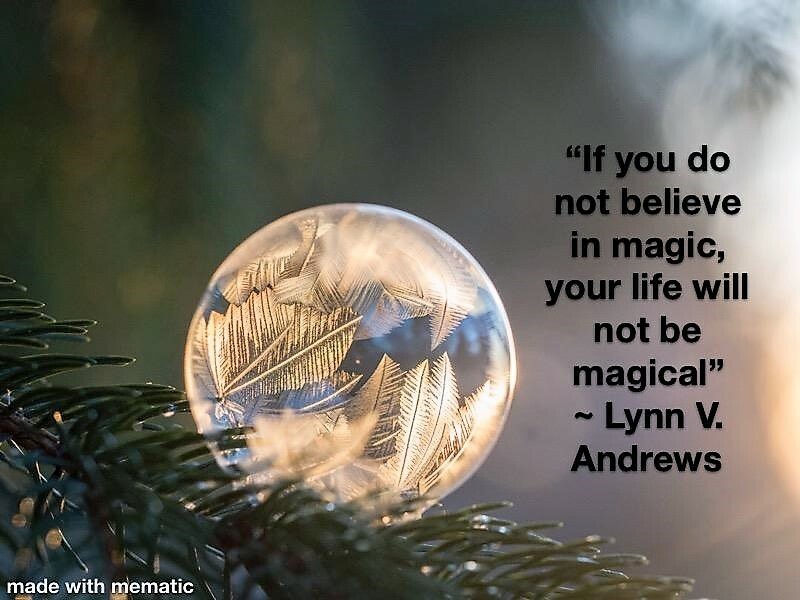 Magic, like the power of Stonehenge, is part of the unknowable—that which you cannot describe, but which exists and makes your life extraordinary.” –The Power Deck, The Cards of Wisdom, by Lynn V. Andrews. Like most women I know, birch appears fragile but is extremely strong. We’re all stronger than we think we are, aren’t we? What a beautiful message birch brings us: to appear how we may to the world but harbor our inner strength inside. The birch tree carries ancient wisdom and yet appears forever young. Yoga, too, carries ancient wisdom and will enable you to age gracefully, appearing younger than your years. It is said that a good beginning leads to a good conclusion. So as I ponder our new beginnings here at NOLA’S surrounded by the energy of the Birch tree’s wisdom permeating our yoga space, I am humbled by the symbolism of a fresh start, courage, determination and spiritual growth. And I am honored to be the conduit for those students joining me as we learn the lessons of the birch tree together—that hidden within there is often found great strength. For details on dates, rates, and specials, please click here. Thank you! Hope to see you soon! I’ve shared before that a student of mine suddenly noticed in her down dog that her feet looked just like her mom’s. Ever since then, I’ve used that as a pondering question in class. Who’s feet do you have? Which ancestor has passed those traits on to you? Invite your ancestor into your class. Send a mental “hello” and “thank you” to them right now. Since this is Halloween week, why not instill some thoughts in your yoga practice toward thinking of and perhaps connecting with someone special in your life who has passed on. Perhaps use this thought as your intention for your yoga practice that day. I’ve heard that during this time of year it is easier to communicate with those who have passed since the “veil” between the living and those who have passed is “thinner”. It doesn’t have to scare you. Why not take advantage of it in the spirit of the season? You probably already send them “hellos” on any given day. Why not dwell on the possibility that this time of year it’s easier to visit? “October 31 was the last day of the ancient Celtic year and the Festival of Samhain, the Celtic god of the dead. As one year became another, the Celts believed, the spirits of the dead could return from the beyond to share joy and happiness with their living loved ones. Feasting, dancing, and singing celebrated this opportunity. Enormous bonfires lit the night sky, welcoming revelers and spirits alike. 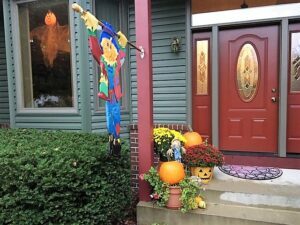 But fearing that some of the returning spirits might have less than honorable intentions, people often donned masks and costumes to hide their true identities. The good spirits of departed friends and relatives of course knew those behind the masks and could make contact for a joyous reunion. The light of dawn, marking the start of the Celtic New Year, recalled the spirits to the spirit world. In 835 Pope Gregory IV proclaimed that the last day in October was to be known within the Catholic Church as All Hallow’s Eve, or “All Holy Evening”. On this date, he decreed, Catholics everywhere were to gather and remember those who had given their lives in the name of their faith. The next day, November 1, became All Saint’s Day (also called All Soul’s Day), a time to remember all who passed on. Personally, I’ve always thought that the more open you are to “hearing” the Universe’s messages, or a loved one who has passed on for that matter, the more likely it will happen—or at least the more likely you’ll notice. The Universe speaks in subtleties so unless you are tuned in, you could totally miss it. That’s where your yoga practice comes in! As a yogi, you’re practice includes listening to the subtle messages your body is sending so it doesn’t have to send a loud scream. So you are, in effect, training yourself to notice subtleties. As a yogi, you begin to notice when your feelings change, when your physical sensations speak up and when your spiritual connection deepens. Sending off mental invitations and silent hello’s to those who’ve passed isn’t hard. You’re probably already thinking of your special someone. You’re remembering them in their own special way, with their own special traits and characteristics. Knowing that you’re open to connecting and knowing that you share a special memory, or that a special something reminds you of them, creates the magical “stuff” your connection manifests from. My mother-in-law’s connection/communication with her late husband was so strong, it continued for twelve years after his death until her passing in 2015. The Universe knows what you’re “up for” too. You may be open to subtle connection but an outright visit might scare the living daylights out of you! Me too! Keep surrounding your thoughts in love and light. I read a book by local but internationally known author, Echo Bodine, called Relax, It’s Only a Ghost. In it, she reminds you to say loudly and firmly “Not welcome!” when you feel scared. Wish I knew that as a small child afraid in my bedroom after a nightmare. On the nights my husband is out of town, I surround myself with guardian angels when I can’t sleep. One corner has the Archangel, St. Michael, in the image of John Travolta’s portrayal. It makes me smile. One is Clarence, from the movie It’s a Wonderful Life—my absolute favorite Christmas movie! One is Gideon, from the Christmas show One Magic Christmas. And the last one is the Archangel Raphael, the archangel of healing and protection who is associated with the color emerald green. (Recently I added Dudley from the The Bishop’s Wife” —another of my favorite Christmas movies!) By the time I’ve conjured up these images and colors at the four corners of my bed, I’m content and less on edge. This is what I mean by surrounding your thoughts with love and light. Connections come in subtleties. It might be the shape of the clouds in the sky. It might be the cardinal that you suddenly see or hear. It might be that the rain stick near your fireplace drops a pebble out of the blue at just the right time. Both the cardinal and the rain stick are my dad’s form of communication with me. I don’t believe in coincidences. My dad’s been gone for over 15 years now. The rain stick became his mode of communication some time ago. He knows it. I know it. It’s an old friend by now. When I hear the pebble drop or see the inquisitive cardinal, I simply say “Hi dad. 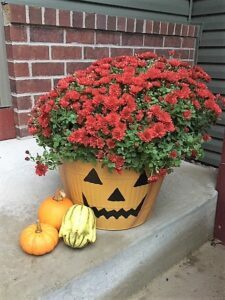 I love and miss you too.” Happy Halloween everyone! Create your own magic by inviting it in! Comments Off on Crack Open the Magic! As hard as it is to say goodbye to summer, the rituals of Autumn hold our hand as we journey into the cooler seasons, helping us ease into cooler weather—like putting on a warm sweater. 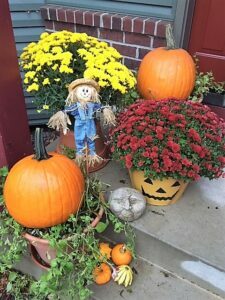 The Autumnal celebrations are a healing balm for our soul. Winter is a time of introspection. It is a time to cocoon inward as we transform into our next evolution of what the Universe has in store as our next expression. Halloween recalls the magic of donning the childhood gypsy costume to embody the energy of THAT persona as it might express itself through me. And scarecrows reminds me of the importance of having a big heart in all that I do—a la Wizard of Oz. Scarecrow helps me remember everything you ever really need is always there inside of you, right at home. The inner child awakens. The magic is here. Crack open the magic! These decorations bring out my inner child, giggles and all. What brings out yours? Thanks for subscribing to my newsletter/blog! I so appreciate each and every one of you! Want to have a yoga class available at work? I can help with that! Let’s start something amazing at Nola’s! A little over six years ago the building my yoga studio was located at in Roseville, MN was bought out by a nursing home; and my second location’s owner lost her lease. She moved to a location with no room for yoga. All this happened within one week’s time. My next location was only available for what seemed like half a second. The owner closed shop—I was renting space. One of my regular yoga students approached me to start teaching at her friend’s house and a new business model was born! I’ve since expanded into on-site corporate yoga as well. If you follow my blogs, you know I follow the signs sent from the Universe. I never thought going in-home private (and now also on-site corporate) was going to be my only teaching venue; but I am oh so grateful for the student who suggested it! It has and continues to be a perfect business model for me! It seems the Universe is bringing me another excellent opportunity and I couldn’t be more excited! Recently a local restaurateur, Kavita Mehta of Nola Restaurant in Osseo, MN, asked me to consider teaching yoga at her event center there. When she shared that the roots of the dishes served at Nola’s are rooted in the ancient Chinese, Indian Ayurvedic and Unani health systems, well I sat up and took notice! Ayurveda is the sister science to yoga and another love of mine! Healthy eating, based on Ayurveda, is part of my training and is the backbone of the YogaLean Workshop I offer! Kavita’s offer for me to teach yoga at Nola’s was something I had to consider! We are hosting a free yoga class Thursday at 10 AM on October 4th to kick this off! For rates and dates going forward, please click here. Please join us and bring your friends! I’m really looking forward to expanding here with this partnership! Let’s start something amazing at Nola’s! While I have you! Check out my links page! Beatles fan? Love George Harrison’s “While my guitar gently weeps” song? Check out this “Weeping Guitar” art print by Erica Free! (She’s the top link on my site) It comes in two sizes! Can you say early Christmas shopping? Have something special to commemorate? I used to buy Neil Diamond albums whenever I accomplished something major: new job, promotion, completion of a major goal, etc. Lately I’ve been buying a mala to commemorate my accomplishments since my focus has been on all things yoga for the past several years. Please check out my favorite local yoga teacher’s link at YogSadhna—Beautiful malas! I hope to see you at one of my venue’s soon! Thank you so much for subscribing to my newsletter! I appreciate each and every one of you! Midsummer, or Summer Solstice, is said to open the magical doorways of Nature. Ted Andrews said the physical and subtle bodies of humanity are aligned at this time and for those working with these energies, (like those of us who practice yoga), a new and more stable alignment can be established, bringing even greater growth the upcoming year. What a perfect day to ALSO be International Yoga Day! This relationship between the physical and subtle bodies is what yoga IS to me. Working with the physical touches and works on the subtle, and vice versa. They are inextricably interwoven. Beautiful, isn’t it? This is why emotions are stored within our body, sometimes waiting for us to be better able to handle them perhaps later, sometimes lodged so deep we don’t even know they’re there. Yoga enables them to find a peaceful untangling and release. At least that’s been my personal experience. The longer I’ve practiced yoga (going on 30 years or more now), the more personal it becomes. I am in a continual conversation with the subtleties of my body’s language. Sensations become “familiar” like an old friend. They always have a message. It’s taken me this long, with the additional help of my most recent Chronic Pain YogaFit two-day training, to gently remind the sensations of pain that I am safe, secure, centered, and at peace. Sometimes I even repeat the movement that just sent the pain/danger signal (because that’s what pain is—a signal of danger). And as I repeat that movement I am saying “See? —safe. I am safe. This is a safe move. See?” This one thing alone has been HUGE for me. I can literally feel the pain subside with each successive repeat of the movement. Try it! I’ve been working on many old injury muscle imbalances, scar tissue, etc that have found a home in my body from various injuries. Creating a safe haven within your body—that’s what yoga means to me. Happy International Yoga Day! Over the past 10+ years I’ve painstakingly discovered many things about hypothyroidism. What I’m about to share is my own research and my own decisions made for myself. The list is NOT exhaustive, I’m sure. They’re not meant to be your blueprint or to make your decisions so much as for you to be aware of areas you might want to research for yourself. This is my way of saying I don’t even play a doctor on TV! So do your research and talk to your doctor! Hypothyroid disease is associated with diabetes (the pancreas is part of the endocrine system) and increases your chances of other auto-immune diseases (the thymus governs the immune system and is part of the endocrine system. You’re taking blood to check my thyroid which is part of the endocrine system. Why not check out the other family of organs in that system? They all work together. I’d had more than one blow to the head over my lifetime (childhood falls, line-drive to the head during softball requiring eight stitches, neck/back injury almost 20 years ago now.) Traumatic brain injury can injure your pituitary gland (another endocrine gland) and even years later can be associated with hypothyroid disease, adrenal insufficiency, diabetes…there’s more. Vitamin D is a hormone and low levels are associated with a higher risk of thyroid antibodies which are found with autoimmune thyroid disorders like Hashimotos Disease. Yup that’s right and I have discovered that low levels affect many bodily functions. I didn’t know this particular detail of Vitamin D at the time. I just knew it was an uber-important vitamin (can you say cancer risk and progression for starters?) and living in Minnesota increased my odds of being low on Vitamin D since we make very little Vitamin D except during the summer and sun screen blocks the production of even that. My new doctor gave me a full thyroid panel test (along with my Vitamin D) which included checking my thyroid antibodies. Guess what? I had Hashimotos Hypothyroid disease and low vitamin D levels. Yes, my previous doctors knew I had outgrown Juvenile Rheumatory Arthritis (another auto-immune disease) when I was younger so the increased odds of other auto-immune diseases were there. Why didn’t my first doctor wonder if I had Hashimotos Hypothyroid disease vs. just hypothyroid disease? Did you know up to 90% of all thyroid problems are autoimmune in nature—the most common of which is Hashimotos? Let’s check your antibodies starting at an earlier certain age while we’re drawing blood for that cholesterol check we’re doing anyway. Why didn’t my first doctor check for antibodies? Or, even better, why isn’t checking for antibodies part of every physical starting earlier—before a hypothyroid diagnosis? You see often your antibodies start to rise before your TSH (the usual test for whether you are hypothyroid or not) rises into the hypothyroid range. Finding that out early gives you a chance to change your diet and lifestyle possibly avoiding the progression to Hashimotos. 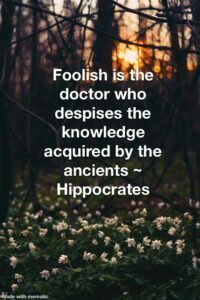 By the time they diagnosed my Hashimotos, my thyroid had been under attack for over the eight years it took me to get that tested. I had no idea of the above until I began researching. It’s much more difficult to correct the damage to the thyroid after a longer amount of time—a duh. Sadly the current fix of prescribing Synthroid® only works on balancing the hormones (T4 and T3). It does nothing to address the fact that your immune system is attacking your thyroid! Which is probably why they don’t check the antibodies early. They don’t have anything in place to address this. I remember reading with total dismay on the Synthroid® drug fact sheet that the side effects of the drug worsen as you age and the longer you’re on the drug. So, I thought, what’s the game plan here? My step-mom’s Hashimotos had progressed to Sjögren’s syndrome—another auto-immune disease also associated with Hashimotos. I had no desire to experience what I saw her go through (loss of teeth, loss of enjoyment of food, difficulty eating due to little saliva in the mouth). Being gluten sensitive is associated with hypothyroid disease and avoiding gluten in your diet is associated with an improvement in thyroid function. Well, that would have been excellent to know at the get-go!! Two weeks off gluten and it was night and day, black and white difference. I wanted to kiss my chiropractor but we didn’t know each other that well. So I suspect going gluten-free helped my thyroid function for a bit longer before the TSH levels no longer measured well. Gluten-sensitivity is associated with joint pain but so is hypothyroid disease. I personally don’t think this is a coincidence. I had cherry tomatoes, cucumbers and peppers for lunch every day—that was it. And breakfast was a gluten free cereal with skim milk. Dinner was usually chicken with a starch and vegetable. Yes I snacked, but not excessive junk food. I prided myself on how well I ate as well as my disciplined exercise regime. If you know me, you know that I am not overweight. Giving diet suggestions was, to me, insulting. (Now my breakfasts have more protein, I eat salad daily and have less empty calories at the end of the day like chips (although they are my weakness). Dark chocolate is our dessert of choice when we indulge.) The controversy of cholesterol readings would be another blog. It is sufficient to say being told the two are related would have gone a long way toward making me feel less inadequate. Your thyroid function affects your cholesterol measures. Being hypothyroid means I probably don’t convert Beta-Carotene to Vitamin A well. Vitamin A is important for thyroid function. Since Vitamin A is fat-soluble, you can overdose on it. It gets stored in your body vs. Beta Carotene, which is water-soluble. Typically your multiple vitamins contain Beta Carotene because healthy thyroids convert this to Vitamin A and what you don’t need is released. Do you know how important Vitamin A is for skin health? Do you use retinols in your skin products? I’ve had cystic acne my whole life—complete with scars, tears and embarrassment at times (I know, I know—poor baby, right?). Another chiropractor I went to a few years ago suggested I take a thyroid support supplement. Once I started to take this supplement, my cystic acne went away. This was only a few years ago. I’m 57. I wanted to dance the jig when I noticed this side benefit. I noticed the supplement contained Vitamin A vs. Beta Carotene. This concerned me so I pulled out my thyroid books (of which I had way too many) and researched it some more and realized the conversion of Beta Carotene to Vitamin A doesn’t work well for people like me. I should mention here that earlier, I had started using a Vitamin B cream on my areas of concern in lieu of clindamycin (which is an antibiotic) for my acne. I was trying to be more holistic overall. Vitamin B cream helped tremendously but the cystic acne was still occurring. I could just treat it a bit better and ward it off with the “B” cream. FYI, a sluggish thyroid can also make you deficient in certain B vitamins. There are certain foods you might want to avoid (in addition to gluten) to manage hypothyroidism—like cruciferous vegetables (unless their cooked and you limit the amount you eat and spacing the consumption of these foods for several hours before and after your prescription medicine).They may block your thyroid’s utilization of iodine. A diet too high in fiber can alter our absorption levels of your thyroid medications. This one boggled my brain. Again, these are foods that are good for you so I don’t avoid them. I just am aware too much of a good thing can simply be too much. If you standardly consume high fiber, your blood tests will reflect that in the dosage of your thyroid medication. Talk to your doctor. You might try an auto-immune paleo diet. It’s helped some extremely. Some suggest avoiding night shade vegetables (potatoes, peppers, tomatoes, eggplant). Remember the lunches I was having when first diagnosed? I think the sensitivity to nightshade varies per person, as do most of these recommendations. I try not to overdo it but still consume them because I decided these foods are healthy and I refuse to avoid them all together. That’s my personal choice. You make your choice after consulting your doctor or dietician. I’ve tried avoiding them with no change in symptoms, but truth-be-told I probably didn’t avoid them long enough. My husband and I muscle test pretty much everything now though. Night shade vegetables can also affect arthritic joints. Excess fat and sugar is never good but remember I said diabetes and hypothyroid disease are associated. So are gallbladder issues and hypothyroid disease. So breaking down fats can become an issue. Personally, I eat plenty of healthy fats like ghee, fish and coconut oils. I’d add avocado here but I’m allergic! (It’s a common allergen.) That’s my choice after my own research. You do yours and consult with your doctor! You may want to avoid soy foods, which includes edamame, tofu, and miso. There’s some controversy on this one. Do your own research. We should all avoid packaged foods and eat closer to nature. If it doesn’t look like it came from the earth, some would say don’t eat it. Do I follow this all the time? No. But I do for a majority of my diet. Hypothyroid disease is associated with blood pressure issues—as is eating packaged foods because of sodium content. Now I’m reading that both high and low blood pressure can be associated with thyroid disease. Avoiding alcohol is recommended but red wine “on an occasional basis is fine for some people. Red wine is my alcohol of choice. Mercury from amalgams can accumulate in your thyroid. If you’re hypersensitive to metals, this can be a problem with symptoms that overlap Hashimotos. I’m currently in the process of switching from the standard treatment for hypothyroidism to a compounded formula. Without losing your interest, the standard treatment is giving you a hormone that is supposed to convert to another (T4 to T3) and fill the bill for both. Well, I wasn’t converting well. So they’re now working on a supplement containing T3 too. I wonder how many people are on the standard T4 and still feel lousy without checking further? I think it might have been beneficial for a doctor to say exactly what she said as option #1. Many take this Synthroid® and they’re good to go, BUT if you want to investigate other lifestyle changes via your diet, here’s a good dietician and/or endocrinologist I’d recommend—option #2. AND by, the way, here’s some facts about hypothyroid disease that you should be aware of. So yes, your cholesterol is a bit high, but it can happen with hypothyroid disease. Here’s what we can do…. I’m still learning. I just read that some scientists are beginning to consider the possibility that Alzheimer’s disease is an auto-immune disease. My dad passed away of Alzheimer’s so believe me—I don’t want to go there! Keep on learning. I hope you found some of this useful. I just needed to download. Thanks for listening! Here’s to your health! I recently had to switch doctors since my regular doctor moved on. As my new doctor was doing the routine exam, she inquired if “that” has gotten worse at all. “That”, I asked? What do you mean by “that”? She meant my belly-button! I was a bit flabbergasted. I’ve had “that” for 52 years. It’s my belly button and no, it is NOT a hernia! I have to add that my belly button is not grotesquely “out”. It is a simple “outie” button. No, I’m NOT taking a photo! St Thomas Aquinas saw the navel as the “bodily metaphor for spiritual things.” The navel has been considered the “ultimate power point” in yoga and other oriental disciplines. Chi and vital breath is thought to “emerge” from the navel. Sigmund Freud thought the navel point was where a dream’s message and its psychic significance connected. My dreams were where I got the name for my business—Better Day Yoga. Hmmm, something to dwell upon for this “outie” belly-button’s significance! If your belly-button has that much significance, wouldn’t you want it to be more than a mere indentation? Yes, 90% of you have an “innie” but 10% of us have an “outie”. I didn’t know that figure until I researched it for this blog, and frankly up until I did the research, I always thought mine was the “correct” version—I mean an “innie” doesn’t look like a button now does it? I guess I knew I was in the minority, but hey—perhaps I’m special that way. Last week I wrote about gathering energy emphasizing some ways spiritual energy grows. You’ve all felt this in your “favorite” spots, clothes, people. Right? There’s a reason you are attracted/attached to those favorites. Your energy resonates with that place, person, or thing. There’s a reason we use the term “magnetic” when referring to some personalities we are drawn to. Magnets attract, right? One of my favorite books, The Celestine Prophecy by James Redfield uses synchronicity as a clue that you’re on to something, because “everything happens for a reason”. As for myself, I believe it may have been this book that introduced me to the power of three. Three is a sacred number. Trinities appear in many of the world’s religions and cultures: Father, Son, Holy Spirit; Mother, Maiden, Crone; Brahma, Vishnu, and Shiva. If something comes to me three times—be it an idea, a song verse, a contact, etc.—I sit up and take notice. The Universe is trying to tell me something. In the book I remember the author suggesting that if you have two roads to travel, take the one that glows with an energy you’re attracted to. What lights you up? Go there. Another favorite book of mine is The Secret by Rhonda Byrne. The Law of Attraction would go so far as to say our thoughts are things and they create so make them good ones. Because “energy goes where attention goes”. And “what you focus on expands”. “What you resist persists”. I could go on but I think you get the idea. The bottom line is this: Your life is a reflection of what you believe. Or as Wayne Dyer says in his best-selling book, You’ll see it when you believe it. Energy appears to you in forms you will accept. For example, I believe Quan Yin, Tara, Athena, White Buffalo Woman, Lakshmi, and yes Isis, among others, all embody the “Divine Mother”—the loving, nurturing, magical healing energy. I believe they are different representations of the same energy and embody different forms so they’ll appear in the correct form for you to accept. We are only open to that which we believe in—yes? So why wouldn’t “Divine Mother” energy embody many forms for all the world to appreciate? Do you believe in energy therapy? Do you believe there’s a reason we rub an injury after bumping an object? We have energy centers in the palms of our hands. Do you believe that there’s a reason we rub our forehead points when stressed? These are reflexology points that help you relax. How about when we cross our hands over our chest and rock when we are very stressed? The points below the collar bone covered by crossed over hands are also important meridian points for stress and anxiety (among many other things!) and rocking is soothing to our nervous system. Our body innately knows what it needs. How about Reiki? Do you believe in this mode of healing energy? I don’t believe Reiki (or any type of energy therapy) will be as effective if you don’t believe in it. How could it be? Why would energy be attracted to you if your energy (and yes, we’re all scientifically proven to be energetic beings) is repelling it? Henry Ford was famous for saying “Whether you think you can or you think you can’t, you’re right.” Again, we’re only open to that which we believe in. If you can’t accept it, you won’t receive it. Body, mind, and spirit are intimately connected. There’s a reason Jesus is quoted as saying “your faith has healed you.” Placebos work because of our belief in them and as Wayne Dyer used to say “If it’s placebo, I’ll take two.” Do you believe that your beliefs/thoughts have energy? I judge by experience. When my husband fell off the roof a couple of years ago and broke the talus bone in his left foot and his right big toe, I began sharing Reiki with him regularly sometimes several times throughout the day. Prior to his accident, I wasn’t sharing Reiki with him regularly—just here and there with no consistency. As a result, my practice was limited. There’s something about sending your energy to someone you love that amplifies the effect. I learned the hard way that I need to set the intention not to drain my own energy. Reiki uses Universal life energy, but if you don’t set the intention right, you’ll drain your own. I gladly gave my husband all I had at the time. He would sometimes jump as he felt what he referred to as electrical charges when I held my hands over and around his healing talus bone and toe. I’ve always believed in visualization. So I’d visualize him dancing the polka with me (we both are very Polish) and running up and down the stairs. As he healed and as time passed, the “electrical charge sensation” that made him jump were less and less; but he can still feel the energy flowing out of my hands. I still share Reiki with him each morning as he shaves as our schedules permit. I sit on the floor, surrounding his foot with crystals to magnify the energy, and wear various crystal Malas adding yet more crystal energy. (Don’t even get me started on whether you believe in crystal energy! Crystals are in watches, computers, and even your mobile phone. That acronmym “LCD”? It stands for “liquid crystal display.) I trace the “Cho Ku Rei” symbol on the palms of my hands with a small selenite wand and proceed. My “go-to” meditation prayer, the Hail Mary, dominates my Reiki sessions. I’ve noticed that reciting this prayer helps the energy build. One of my yoga students, with whom I shared Reiki during a final relaxation, can actually see energy. She shared with me that my Reiki energy appeared to her as “Mary energy”. This was such a huge gift to hear! I hadn’t shared with her that I recited Hail Mary’s much of the time while sharing Reiki. A Reiki session just after I’ve meditated using this prayer has more energy at the get-go. Remember energy builds. My husband and I have come to treasure our morning Reiki ritual. I open each session with a silent Pope John Paull II prayer (calling on our Polish ancestry) and end it with saying the St. Francis Prayer out loud—a mutual favorite of ours. As I finish reciting the prayer, my husband touches my head as a sign of endearment. Remember, I’m sitting on the floor as he stands to shave. Once he started doing that final touch, I asked him to please do it every time because it has a sense of sealing the energy of the moment. Our mornings aren’t complete when we aren’t able to complete this morning ritual. It means something to us. It’s part of our connection—our energetic connection, if you will. Spiritual energy builds and grows stronger when you work on it. It’s all energy and it’s all good. 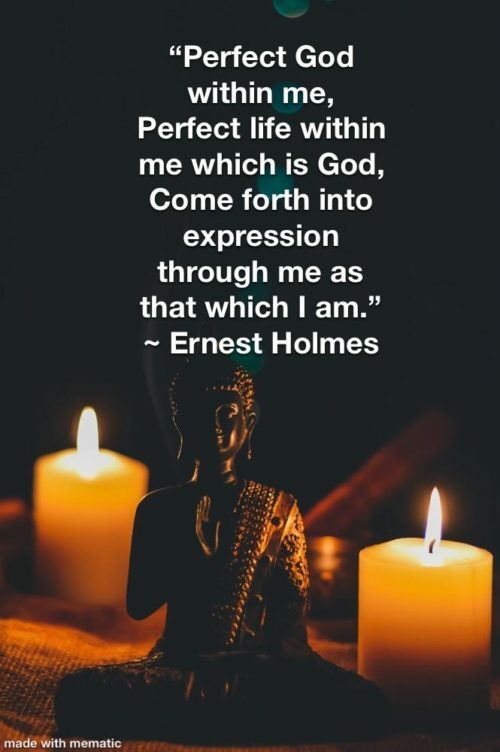 What are your personal spiritual entry points? What practices do you use to come to center? How often do you participate in these practices and do you notice a difference when you do them regularly? They say it takes anywhere from 21 days or more to create a habit. Depending on the goal of your practice, the degree of difficulty, your actual desire to incorporate it into your life, and the sense of peace or joy you attain, the time it takes will vary. But one thing is agreed upon—it does take time. Time is the magic ingredient. How dedicated are you to devoting this time? Do you have a favorite prayer, mantra, or affirmation? Why is it your favorite? My anchor prayer is the “Hail Mary”. No, I’m not holier than thou. It’s a prayer that has been with me my whole life in times of stress, in times of contemplation, when I pray on my beads—be they rosary or mala—or when I give Reiki to a loved one. It’s the first prayer that comes to mind when I’m needing comfort, solace, or energy. It’s my “go-to” prayer because it’s always been there for me. How about your favorite rituals? One of mine is lighting a candle and some incense in my daily yoga practice at home. I’ve read that the ancients believed the rising smoke is an analogy for the rising of our prayers and intentions to the heavens to be heard. My yoga practice isn’t quite complete without the candle and incense. It’s a noticeable loss of energy when I’m practicing in a hotel room on the road without the benefit of their presence. Of course, I still do my practice but it’s not quite the same. Rituals are our way of paying reverence to what we are doing. It’s a seal of sorts. Do you have a Mudra practice—similar to reflexology/acupressure for your hands? “Mudra” in Sanskrit translates to “seal”, “mark”, or “gesture”. Whether you call it one or not, I guarantee you have practiced Mudras because literally any position you put your body in will create a different energy loop. The one you’ve most likely held without thinking of it as a Mudra is prayer hands—or Anjali (meaning: “to offer”) Mudra. Bringing your hands together over your heart, connecting left hand to right hand, actually connects the left and right sides of the brain allowing you to communicate more effectively. Cool, huh? How appropriate. 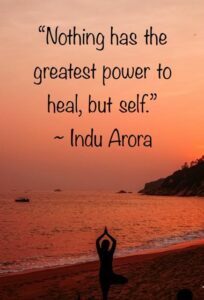 Indu Arora’s book, Mudra The Sacred Secret, is by far my favorite book on Mudras. That’s probably because Indu is by far my favorite teacher! I’ve learned from her that it takes 30 seconds for the Mudra to form an electromagnetic circuit. I’ve been practicing hand Mudras more “on purpose” ever since I used a Mudra for headaches listed in her book. This was shortly after her book was published in 2015 when I was lucky enough to be at her book launch. I normally don’t get headaches but I had a huge one that wouldn’t go away for hours and I started to get nauseous—a sign of a migraine. The headache Mudra worked so well for me, I had to sit up and take notice! I’ve been using it successfully ever since whenever even a subtle hint of a headache comes along. With Mudras, your fingers are held in various positions forming an energetic loop. When I hold a Mudra hand position, I begin to feel an energy ball—a tingling sensation—in the palm of my hands. I’ve noticed that the Mudras I regularly practice holding develop this tingly “energy ball” sensation within a shorter and shorter timeframe. I’ve had a daily yoga practice for many years now. It feeds me in ways I can’t describe. It’s not just physical, but of course that’s one of the many benefits. It’s like an ‘Etch a Sketch’ for what ails me—a magic eraser. You may come to yoga for the physical practice but it won’t be long before spirit joins you. I consider my yoga mat sacred ground. It’s as though all the good energy from my previous practices is held within my mat; and as soon as I set foot on my mat, I’m immersed in their vibes. It’s a gathering point of cumulative energy. Your mat never forgets your previous practices. Like an old friend, it holds the memory of sacred space ready to embrace you the moment you enter. Asana practice, done with the right intention, allows you to become acquainted with your physical body, yes; but, more importantly, your subtle body. Your body’s only way of communication is through sensation. Once it knows you’re listening, there’s no stopping the messages! The more you listen, the more you’ll hear. It’s cumulative. This is why a Hatha Yoga is a training ground for your intuition. Your inner knowing becomes your best friend. You learn to trust your gut instincts. Do you listen to your body’s subtle messages? Your gut instincts? There’s a saying in yogic wisdom that if you listen to your body whisper you won’t have to hear it scream. My other spiritual entry points include a meditation shawl and mat. Wrapping a meditation shawl around my shoulders brings more comfort than simple warmth. It brings all the previous meditations to accompany my next meditation. It’s like planting seeds in fertilized soil. The prayers said that day more easily take root within and bring me back to center. If you doubt the truth to this, try taking a child’s favorite blanket or stuffed animal away from them; or try substituting another blanket. Enough said. Indu Arora says “When we meditate at a place over and over, that region becomes a magnetic field for the mind to enter the calm, clear state gracefully and effortlessly. Having a personal meditation mat helps give you a still anchor point as well as helps build a certain association to the practice.” She explains that it’s important for the passive energy that’s awakened through meditation to stay looped within the body and the meditation mat helps keep the energy contained within the body. She further compares our body to a Yantra, or geometrical pattern of energy moving in a circle and triangle. Our body mimics the triangle in a meditation posture. Without a base, our Yantra is incomplete. A meditation mat is yet another tool for gathering and containing your energy. The bottom line is this: Spiritual energy grows. How do you enter your sacred ground? What do you surround yourself with to gather, contain and hold the energy of your spiritual practice? Once you start to pay attention to the subtleties of accumulating prayers and intentions, you’ll start to notice a distinct difference each time you enter your sacred space. You’ll start to notice your own spiritual vortex welcoming you home. Your sacred space is waiting…. Who has my remote control? Have you ever been driving down the road and someone cuts you off? It’s hard to hold your tongue sometimes, isn’t it? Oh if my car had ears it would be blushing! This is something I’ve worked on and have been much better at being detached when upsets happen—in the car any way! During one of Indu Arora’s workshops at the Minneapolis Yoga Conference, she likened it to giving each upset one of your remote controls. It’s true, isn’t it? We’re allowing them to push our buttons, right?! She said we should make a point to reclaim our remote controls. At the end of class she suggested to ask for at least five of our remotes back. So now when I start to have an upset while driving, or whenever, I’ll either mentally say or say out loud “I’m taking my remote back, thank you!” This small exercise has made me chuckle at the situation because it really is funny when you think about it. We’re allowing someone else to push our buttons and by asking for our remote back, it lightens the mood and makes you smile at your silliness for allowing it in the first place. Try it! You’ll start laughing at what just a few seconds ago made you angry! I love this little phrase: “I’m taking my remote back, thank you!” It has allowed me to become a witness to the emotion vs. become the emotion. And it’s also very liberating! What ways have you come up with to stay detached when situations become heated? You know your body can’t tell the difference between real danger and imagined danger. Our upset moments really are a creation of our imagination. By allowing our body to gear up for action with our anger, we are turning on our fight/flight mode—our sympathetic nervous system. These constant assaults to our body DO affect our health and longevity in a very real way. Our adrenal glands release the stress hormones adrenaline and cortisol which increases our blood pressure, heart rate, and respiration. And that’s just the tip of the iceberg! See the infographic on how anger affects the brain and body from NICABM below. Our body is preparing for physical exertion so it directs the blood away from our gut and into our extremities, affecting our digestion in a negative way. Can you say irritable bowel? Using your upsets as a prompt to release anger and detach from the emotion is a not just smart, it increases the health and well-being of your physical, emotional, and spiritual body. Who has your remote controls? Take a moment right now to think of five remote controls you’d like to claim back and then visualize taking them back. Smile and repeat. I had the utmost pleasure of taking several workshops by Indu Arora at the Minneapolis Yoga Conference. I always learn so much whenever she’s the presenter! And everyone who follows her workshops feels the same way—we all talk about how much we love and adore her! We are all huge fans of this amazing woman! Her “Ratricharya” workshop—10 steps of Ayurvedic Night Routine was excellent! One of the many things she suggested doing to prepare you for sleep is a Yoga Nidra practice (Yogic Sleep) at night and that includes a “Sankalpa” or intention/resolve of heart and mind. Your Sankalpa is made with a one-pointed resolve to focus on a specific goal and it’s meant to be a noble goal that could possibly serve as a lifetime goal. It’s not just for light-hearted goals. Since I’m in between Level 1 and Level 2 of Indu’s Yoga Nidra training, I have been practicing Yoga Nidra as part of my studies. I decided to use my Sankalpa last night before bed as I drifted off to sleep. I’m looking for “my one thing”. What is it I’m called to do—the one thing that will move my business forward? How do I get unstuck? At one point I was in line preparing to purchase an overflowing bag of what appeared to be very ornate “tacks” with beveled tips that appeared to be solid silver. In the dream, I knew that these tacks were meant for a whole other purpose than I was intending them for. Their purpose was so exquisite that most would use only one or two of them and even engrave their names upon them (my “one thing”). That’s how very special and expensive they were. They were held in the highest esteem by those who used them for a very special occasion. And here I was purchasing an overflowing bag full! As I awoke, I realized this is my usual “M.O.”—“If a little’s good, a LOT must be better!” Well it’s not. I don’t need to acquire any more skills. I don’t need to have one more tiddlywink or doo-dad to work with. Stop the madness! I also need to focus on an “exquisite”, one-pointed goal in my business and then break that down into my daily activities. What is it I want to “tack” onto the vision board of my life? I need to choose my “one thing” and put my thumbprint on it to make it uniquely mine—to engrave my name on it. I spread myself a bit thin and many days never get to the one thing I wanted to accomplish. And my business offerings might need to be pared down as well. Less is more. The shotgun approach never worked for anyone. While I innately knew this, my dream was reminding me it was something I urgently needed to attend to. Still in that office setting, I was having trouble getting my rolling office chair up to the desk. It kept bumping into an obstacle under the carpet that acted like a brake. Without the ability to get my chair where it needed to be, I couldn’t function. I pushed this way and that—No luck. I was getting frustrated but kept working around it trying to figure out what to do. Suddenly in the dream I realized the obstacle was from the previous old arrangement of furniture and all I needed to do was remove whatever that bump/obstacle was under the carpet. It no longer needed to be there and I wasn’t seeing that there was no need to keep it around. “Doesn’t that sound just like me?” I thought as I awoke and analyzed my dream. Many of the obstacles to what I need to accomplish are unnecessary and remain from a past arrangement/condition/belief. I might go so far as to say that a good majority of the “obstacles” I experience are my thoughts about what I can or can’t do—my worthiness so to speak. I need to remove them. They are no longer necessary and are hindering me from my goal. Many times when I’ve asked a question over and over just before I fall asleep, I’ll get some sort of response between sleep and awake. I’ve written about this before. It was how I named my business, Better Day Yoga, back in 2009 after I’d been teaching for over a year. It’s a fun memory. The messages come in a strange vernacular that always tells me exactly what I need to know in the most unique way that many times only I’d be able to interpret. Sometimes it’s like I’m reading headlines off a newsreel in my mind. Last night’s “dream tutorial” highlighted areas I need to work on and the wisdom of the presentation has me in awe. In ancient civilizations, dreams were considered messages from the heavens and the shaman would share their dream messages around the campfire to an eager audience. I, too, consider my dream last night a message from the Universe; or perhaps, a kick in the pants to get busy! “Sweet dreams”. So I’ve been dwelling on “Divine forms of energy”. Along with the Blessed Virgin Mary (my mantra in my morning meditation is the “Hail Mary”/ “Ave Maria” salutation), I believe Quan Yin, Tara, Athena, White Buffalo Woman, Lakshmi, and yes Isis, among others, all embody the “Divine Mother”—the loving, nurturing, magical healing energy. I believe they are different representations of the same energy and embody different forms so they’ll appear in the correct form for you to accept. We are only open to that which we believe in—yes? So why wouldn’t “Divine Mother” energy embody many forms for all the world to appreciate? Today I realized these many forms of Divine Energy are not that unfamiliar to this Catholic girl. They have roots in my history. Marion apparitions have influenced the Catholic Church and the lives of millions of Roman Catholics for thousands of years. These supernatural appearances sometimes appear to an individual or a few people a majority of the time, and sometimes to thousands of people over a period of time. Some of the apparitions have even received a “Canonical coronation” from the Pope, crowning the holy image. These Divine apparitions of Mary are often named after the town where it is reported, such as Our Lady of Lourdes, Our Lady of Fatima, Our Lady of Guadalupe; and my Polish heritage Madonna, Our Lady of Czestochowa. 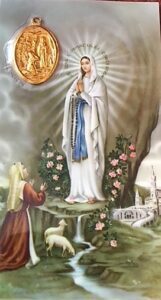 Other times, the Divine image is given a “nickname” of sorts calling out what her appearance is most noted for in that instance, like Our Lady of the Miraculous Medal. I’ve written about Quan Yin and The Virgin Mary before (reposted in the post below this one). 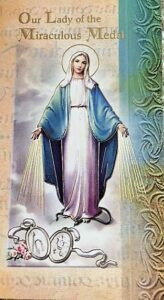 Fairly recently I realized that not only do I consider Quan Yin and Mary of the same Divine Energy, but Our Lady of Lourdes is the version of Divine Energy I associate with Quan Yin because they both have a water element. As I pray my Hail Mary’s and the mantra associated with Quan Yin, “Om Mani Padme Hum” (which means “Hail to the Jewel in the Lotus”), I envision them both pouring their water over me as well as my husband when I share Reiki with him. We had a wedding day photo taken at the Grotto of Our Lady of Lourdes at the University of Notre Dame in my home town. As my regular readers know, this grotto has a special place in my heart because my dad worked at Notre Dame when he first immigrated to America after WWII. He helped with the stonework on the grotto. So I find my visualization of water pouring over us very protective and comforting. We visited the Jasna Góra Monastery in Czestochowa when we went to Poland on our first trip there and purchased the framed picture below. 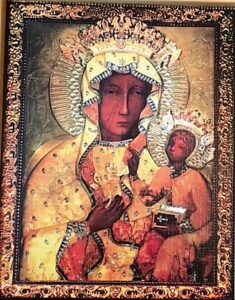 The image of the “Black Madonna” also known as Our Lady of Czestochowa, is considered to have miraculous powers and is shrouded in numerous legends which trace the icon’s origin to St. Luke who painted it on a cedar table top from the house of the Holy Family. As we celebrate the first day of spring and Easter approaches, I’m reminded of the many flowers associated with the appearances of the Blessed Virgin. The rose has symbolized Mary since the earliest times of the Church. Our Lady of Guadalupe is associated with the “Miracle of Roses”. Another flower associated with Mary is the lily, sometimes called the “Madonna Lilly”, which is often depicted in paintings of the Madonna and often seen during the Easter season when they represent the Resurrection of Christ. For those who may be unsure of my “Goddess” association the Catholic religion and Mary, let me remind that the name for “Easter”, Christianity’s most important holiday, comes from the pre-Christian Goddess Eostre, Ostara or “Eastre” who was celebrated at the beginning of spring. How do you connect with the Divine? What are your rituals? How do you make your beliefs come alive and meaningful? This is my meditation. This is my way. Each week I write about what the Universe brings to my attention. This morning as I awoke, my gaze landed on one of my favorite photos of a Quan Yin statue taken just outside Andrea Smith Gallery in Sedona, AZ. The photo is nestled in the mirror of my bedroom dresser and appears just behind one of my favorite statues of the Blessed Virgin Mary—a statue given to me by my mom. Their close proximity to each other is no accident. Their similar coloring (See photo below) practically screamed that I position them near each other. Also, I consider Quan Yin the “Asian equivalent of the Blessed Virgin Mary”. Quan Yin is a bodhisattva, meaning she is eligible for Buddhahood. Yet she’s vowed to stay near Earth until all beings are enlightened. In Sanskrit, her name is Padma-pâni, or “Born of the Lotus. Many think of her as the Buddahist Madonna. She is known as the Goddess of Compassion who hears the cries of the world—a trait also associated with the Blessed Virgin Mary. I was dwelling on this topic, among others, as I was preparing lunch today. I thought perhaps I should save this topic for my newsletter and turn it into a whole focus—adding crystals, colors and wild life associated with Quan Yin. While eating lunch, I tuned into a favorite television show that happened to be on and in the background was a statue of Quan Yin in a park area. That was my sign! Then as I was in the middle of writing this I received an e-zine that contained a story entitled “Crystals and healing in the Buddhist Tradition“. It mentions the mantra associated with Quan Yin: “Om Mani Padme Hum”, which means “Hail to the jewel in the lotus flower”—a prayer I have on my desk next to a Quan Yin statue—and also mentions Jade as a stone considered sacred to Quan Yin. Second sign! A kind lady in Shakti’s Books & Gifts in Madison, WI asked me if I knew who the beautiful Asian lady was on the necklace she was contemplating and I started to share with her what I knew. It was when I mentioned that I’d read Quan Yin was considered the Asian equivalent of the Blessed Virgin Mary, both embodying “Divine Mother” energy, that a childhood memory hit me like a ton of bricks. I remembered we had an Asian lady statue/lamp in my childhood home. Looking back, I’m fairly certain it was Quan Yin, but I didn’t know that at the time. 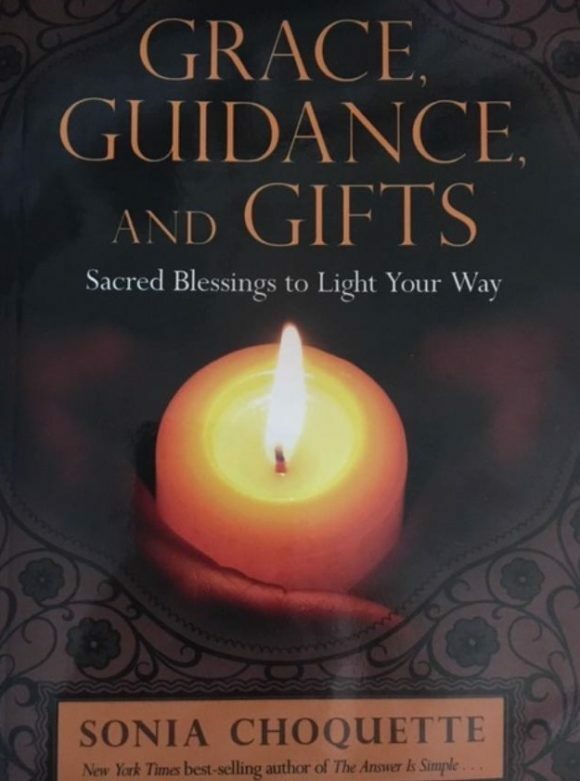 I made the connection as I spoke to the kind lady in Shakti’s Books & Gifts. I was in awe of this statue. My siblings, ever ready to tease me incessantly, knew this and instilled a smidgen of anticipation in me by suggesting that if I watched her intently enough (which I always did), she’d open her eyes. I felt as though she was watching over our whole household. Finding out she was probably the Goddess of Mercy and Compassion was simply an added bonus. I connect with the “Divine Mother” each morning through my morning meditation mantra—the “Hail Mary”/ “Ave Maria” salutation. Along with the Blessed Virgin Mary, I believe Quan Yin, Tara, Athena, White Buffalo Woman, Lakshmi, and Isis, among others, all embody the “Divine Mother”—the loving, nurturing, magical healing energy. I believe they are different representations of the same energy and embody different forms so they’ll appear in the correct form for you to accept. We are only open to that which we believe in—yes? So why wouldn’t “Divine Mother” energy embody many forms for all the world to appreciate? “Hail to the jewel in the lotus flower” resonates “Hail Mary full of grace” and both prayers bring me peace. This post was originally posted March 6, 2013 on a Prana Pages blog I shared with a colleague. That blog has been discontinued so I am reposting some of them as I have time. During my Level 1 Yoga Nidra training with Indu Arora last month, I learned that “Yoga Nidra”, in addition to being the practice, is also a goddess represented by the night or lunar energy. Ancient texts used poetry to honor the beauty, strength and power of the nourishing, protecting Goddess that is Yoga Nidra. We literally complete the Yoga Nidra practice with a moon shower. We visualize the moon shining down over us, filling us so full that the moon energy shoots out of our fingers and our toes. Yoga Nidra puts you in a highly regenerative meditative state. This state helps to support your immune system and increases your resilience and emotional balance. In Yoga Nidra we create a “sankalpa” or intention that is directly in line with what we would like to manifest over a lifetime. In Julie’s “Sacred Stewardship” webinar, she led us through a visualization dropping down into the earth far enough to where no human being had been and then sensing how the energy of that depth and place felt. We were then to imagine infusing this earth energy into our being, sensing how it made us feel—how it affected our energy and well-being. We then visualized infusing this earth energy up into our home via a hose, filling up every nook and cranny of our home with this healing earth energy and noticing how this energy made us feel and made our house feel—how “animated” this energy made us feel. The next meditation complimented the earth energy meditation and focused on the moon. We imagined pulling the energy of the moon down into our bodies, filling us up. Then we visualized infusing the moon energy into our homes as we did with the earth energy, filling every nook and cranny. Only this time the energy was meant to cleanse away the unnecessary energy not needed or wanted in the home. Again we were to notice how “animated” this energy wash made us feel—how alive. I couldn’t help but notice the similarities in using the moon shower in our Yoga Nidra practice to the Shaman practice. The ancients used the energy of the Universe in similar ways. There is only one moon—yet these two practices from different histories and philosophies chose to use a moon shower ritual. I often use new moons to empower a time of growth in my chosen affirmations and intentions—as did our forefathers before. My in-laws used the new moon to plant potatoes. It is considered a time of new beginnings. The full moon is a time of completion and fulfillment. So I ask my yoga students, “What are you done with?” The moon affects the tides of the ocean. Why would it not affect the energy in our bodies which contain a large percentage of water? Why not use the energy of the moon to magnify your chosen purpose and resilience? There are numerous spiritual beliefs and practices that use the moon. Many depictions of the Blessed Virgin Mary, for example, show her standing on a crescent moon. Easter’s date is determined by the first Sunday after the first full moon occurring on or after the vernal equinox. Noticing the similarities in the use of moon energy left me with a sense of connectedness to a spirituality with no labels, only the moon energy being used for our greater good. I recently brought up my affinity for elves, fairies, and all things magical with my hairdresser. I think we were talking about spirituality and beliefs at one point and then as she came back after whipping up my hair color, I shared my new Instagram artist find: @theworldofjamesbrowne. His art focuses on magical beings, elves, gnomes, the man in the moon, mermaids, tree spirits—you name it. His work melts my heart. Who knew I had a kindred soul in my hairdresser who also had an affection toward the wee folk? Come on, you know you want to believe. Just let it happen. It won’t hurt. There’s a huge market for adults who follow Harry Potter books, Avator movies and the like. So you’re not alone. Judging by James Browne’s 38.6k followers, I suspect there’s more than a few of us out there. Well, I must have triggered my hairdresser’s inner child too because while my color was “setting”, she found the book on eBay and ordered it! The whimsical belief in all things magical is contagious! I dare you to look up James Browne’s art and not be drawn into his world of awe and wonder. The illustrator from my childhood book, Garth Williams passed away in 1996. I just read he was the Stuart Little illustrator—another beloved book. James Browne’s art leads me down the infamous rabbit hole in much the same way as Garth’s illustrations do; and for that, I am so very grateful. We all need to visit that world more often. I know I do. How about you? Since I trust my hairdresser implicitly, I also shared my fairy-sighting story. I wrote about it here. That post goes over all of my favorite magical movies too. I hope they’ll instill some magical moments. So as St. Patrick’s Day approaches, be open to believing. Let the whimsy take you back to a time in childhood when magical elves and fairies were your confidants, when the moon smiled back at you with a wink and a nod, and when anything was possible. Happy St. Patty’s Day! I have the honor and privilege of participating at the Women Veteran’s Conference again this year! I will be teaching a yoga class vs. exhibiting this year! We are honored to host retired US Army Brigadier General Pat Foote as the keynote speaker. We will also offer a variety of informative breakout sessions including VA Healthcare/VA Benefits, yoga and holistic therapy. Breakfast and Lunch will also be available for free. One of the projects featured is the ‘I’m Not Invisible” campaign, an awareness campaign designed to honor our women veterans and educate the public about some of the unique challenges women veterans face when they come back from their service. Now they are ready to unveil the campaign to the public, with a portrait exhibit featuring 33 of Minnesota’s women veterans and a multimedia PSA campaign. Please join us, INVITE ANOTHER WOMAN VETERAN. Click here to register. Thank you for signing up for my newsletter. I appreciate each and every one of you.